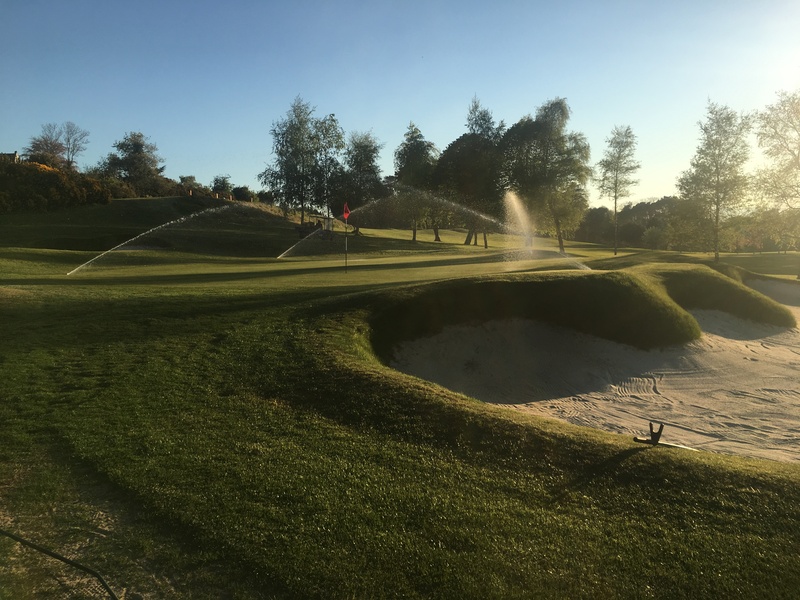 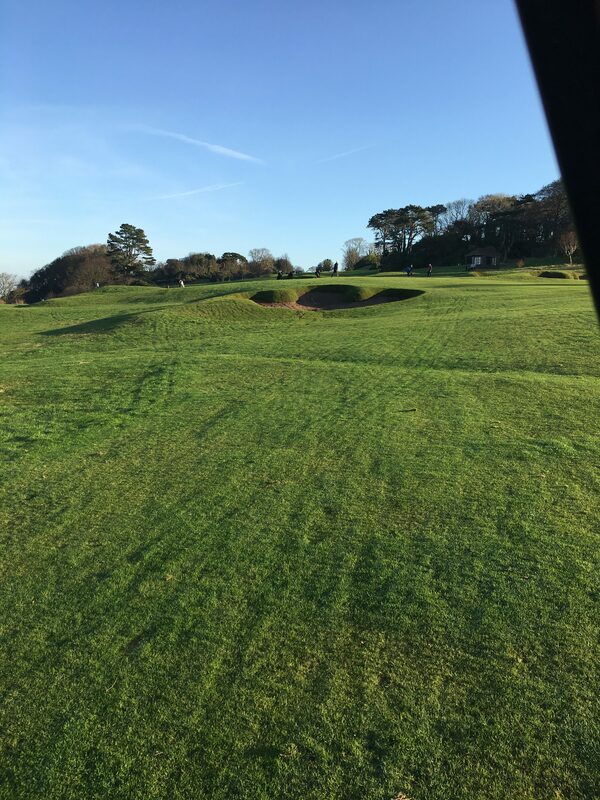 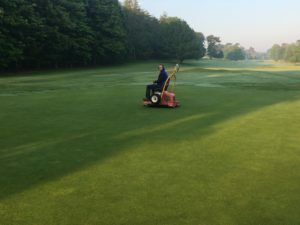 Spring greeted us with dry and sunny weather throughout April giving the green staff ideal conditions for course preparation with the golfing season upon us. 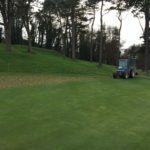 A particular dry April with a recorded level of 7mm of rain made growth slow to begin. 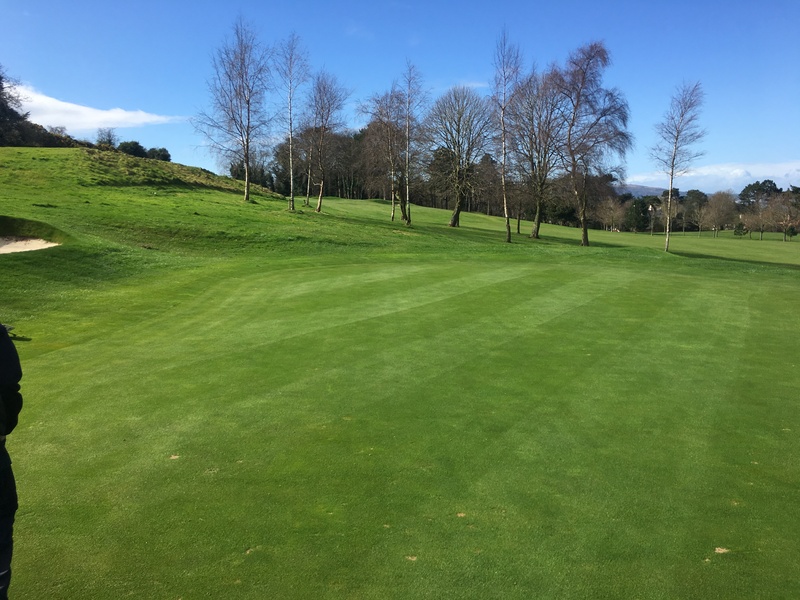 Pleasant temperatures during the day with longer periods of sunshine and cool conditions with the occasional frost at night. 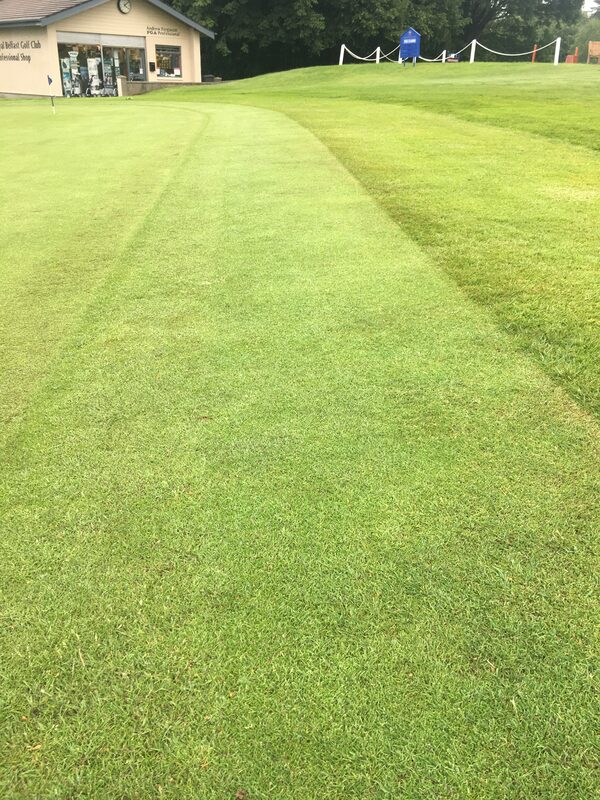 Early growth is essential for all aspects of the course particularly on greens, little or no growth early on coming into the season has an effect on ball roll and speed due a variant of grass species which have slightly different grown patterns and growth rates. 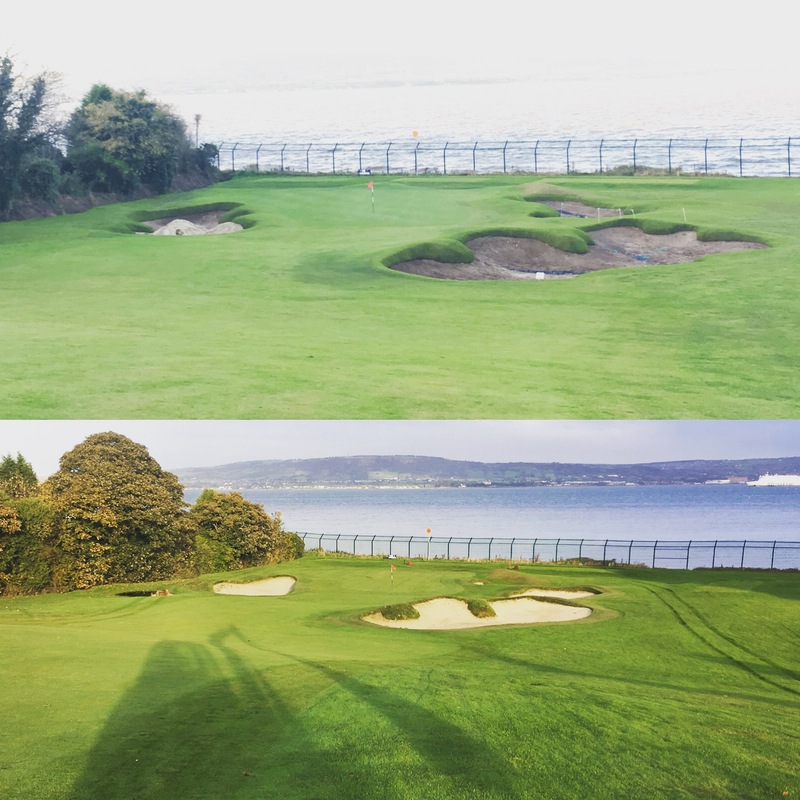 Our north facing seaside location has an effect on grass growth early in the season and is slower to react. 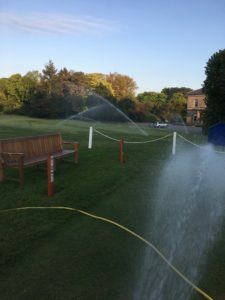 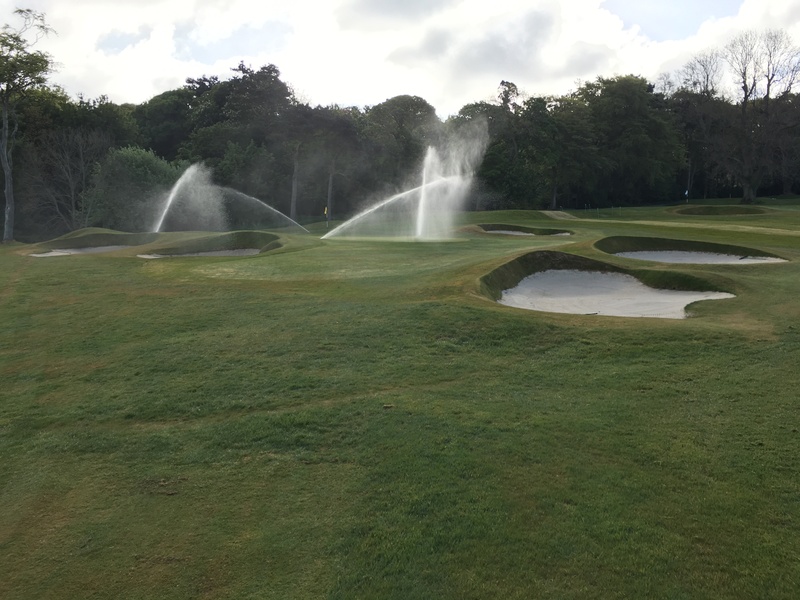 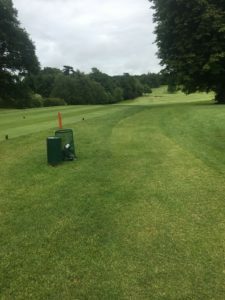 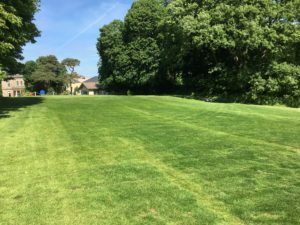 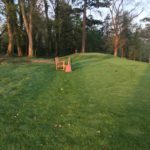 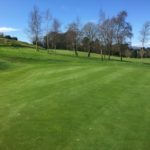 Mid May was the beginning of full growth as April’s dry spell came to an end and increased soil temperatures and moisture really gave the grass everything required for full growth. 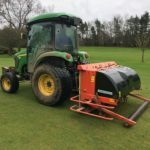 A total of 7mm of rain fall through the month of April and into May was considerably low compared to last years light snow and wet windy weather. Greens and tees had to be irrigated in the early morning and the drier greens at night time. 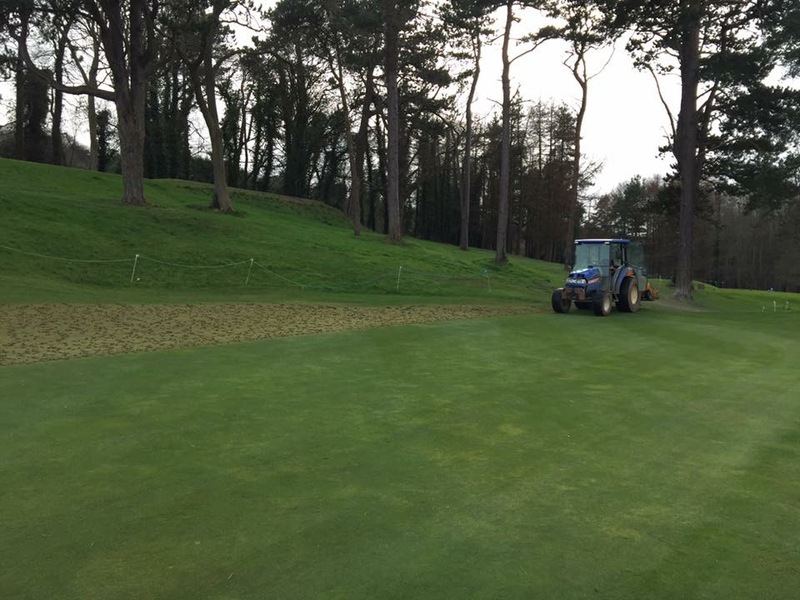 Bare areas around the course have healed well, areas in front of the first tee, third green, and 8th fairway, have been scarified and sown out with an application of spring start fertiliser applied. 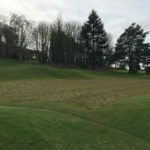 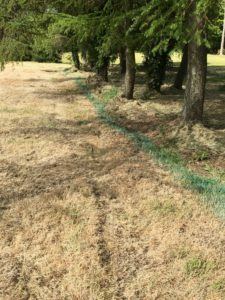 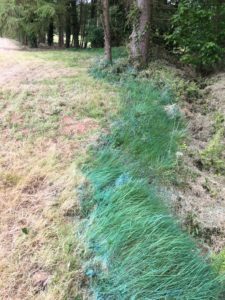 Last years drainage work from contractors has also been scarified, over-seeded and top dressed to remove the bare unsightly look from the roughs area. 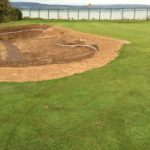 An area in front of the third green has been re turfed and blending in with surrounding area. 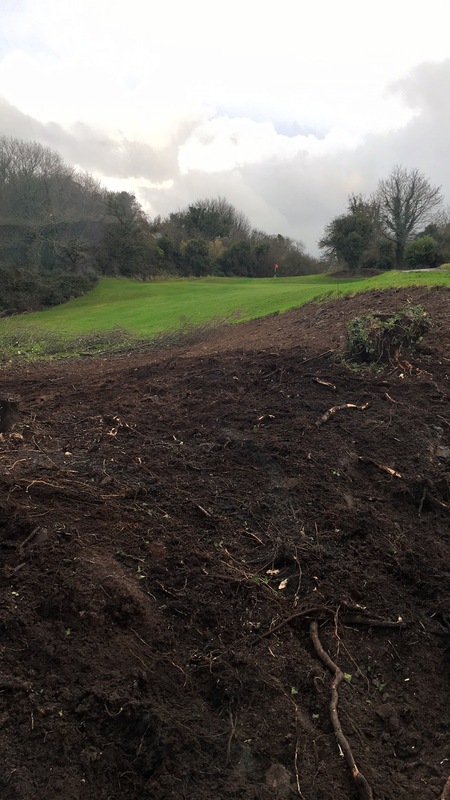 Our winter clearance off the 11th hole is maturing well with 90% grass coverage over the area that was cleared. 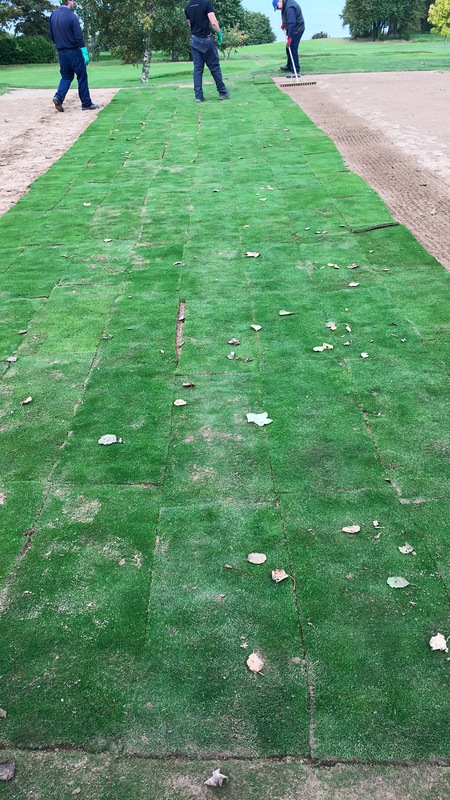 April’s dry weather conditions slowed the seed germination process up slightly but has really excelled during May. 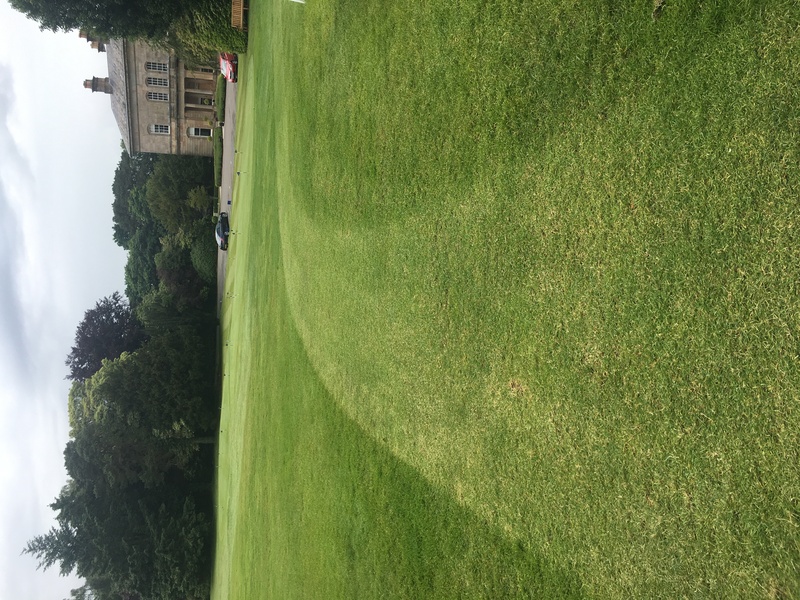 An application of fertiliser has been applied and area has had its first cut. 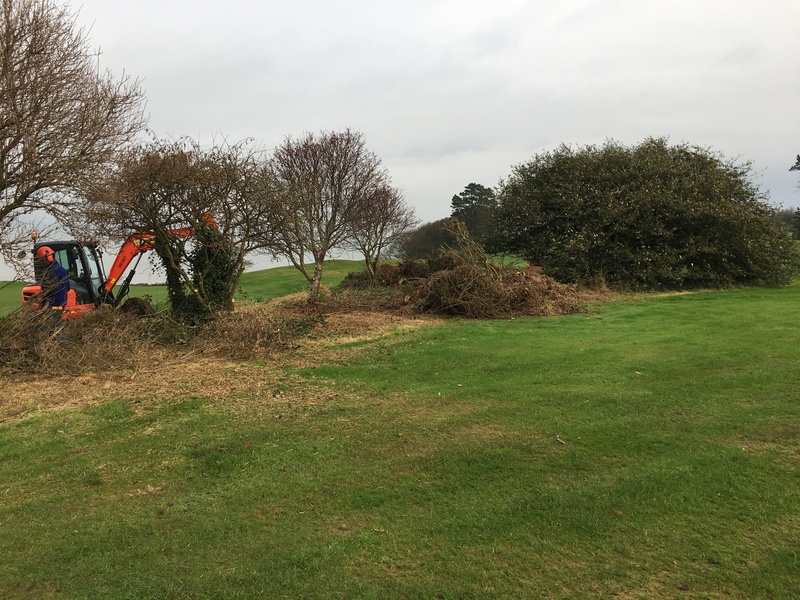 Clearance right of the 9th green has established very well and is now being cut at rough height (50mm), green staff are now able to cut around the trees to keep the area tidy and presentable. 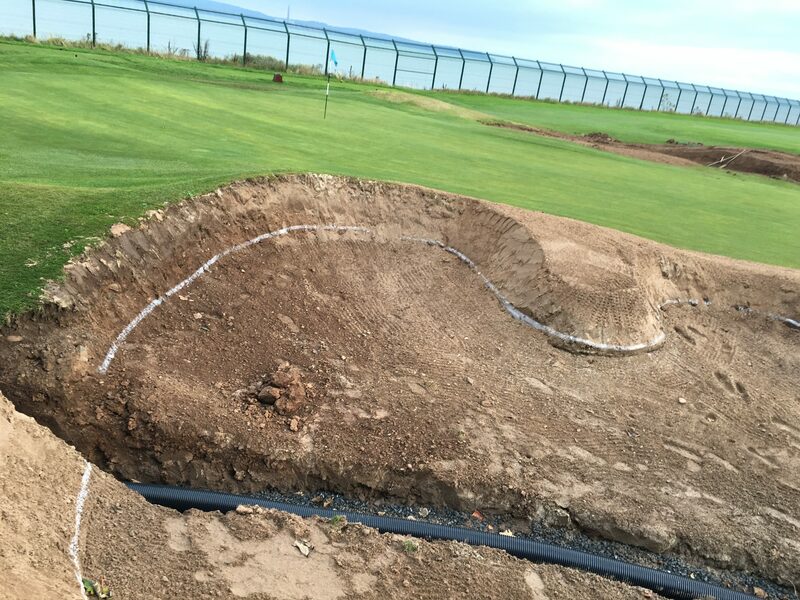 A leaked shot to the right hand side of the 9th green can now be found as the grass is at a short manageable height. Woodland areas at the 1st, 2nd,3rd and 13th have been recently sprayed to remove the long grass growing amongst the trees, this creates a neater view of the course through the tress and helps speed up play. 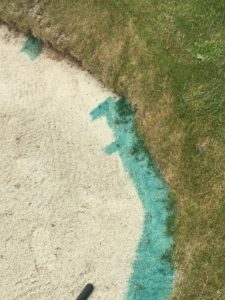 A blue dye spray indicator within the chemical mixture greatly helps the greens staff see exactly the area that has been sprayed and reduces chemical over spray and wastage. Lateral grass growth from the bunker faces are sprayed annually to visually improve the look and general tidiness of the bunker faces. 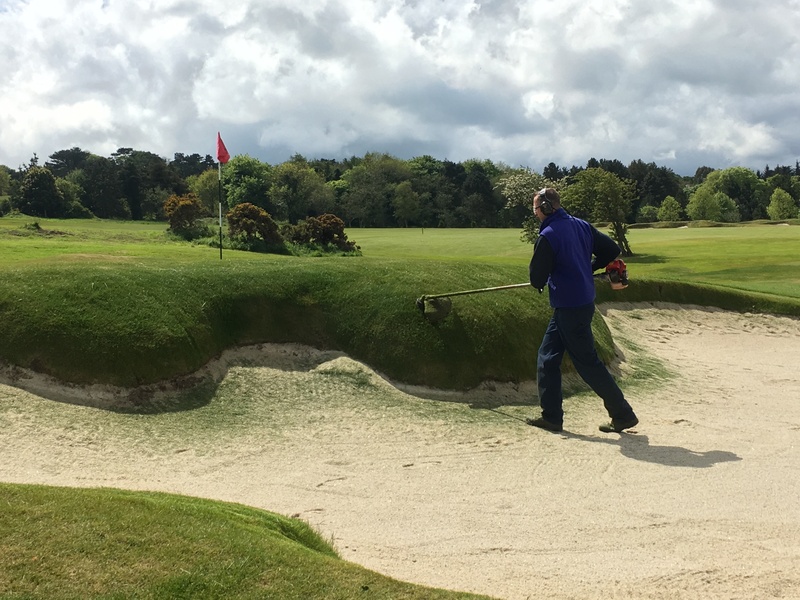 Bunker maintenance is part of our daily routine in the morning, inspecting and raking any feet/animal marks and topping up heavily used areas within the bunker. A monthly strim and weed keeps the 87 bunker faces and edges tidy and manicured. Frequent mowing, rolling, verti-cutting and organic spray applications are some of the practices the green staff do to ensure the putting surfaces are kept to a high standard during the season. Light verti cutting removes lateral growth and reduces ball to grass friction which encourages ball speed and roll, we do this task fortnightly. 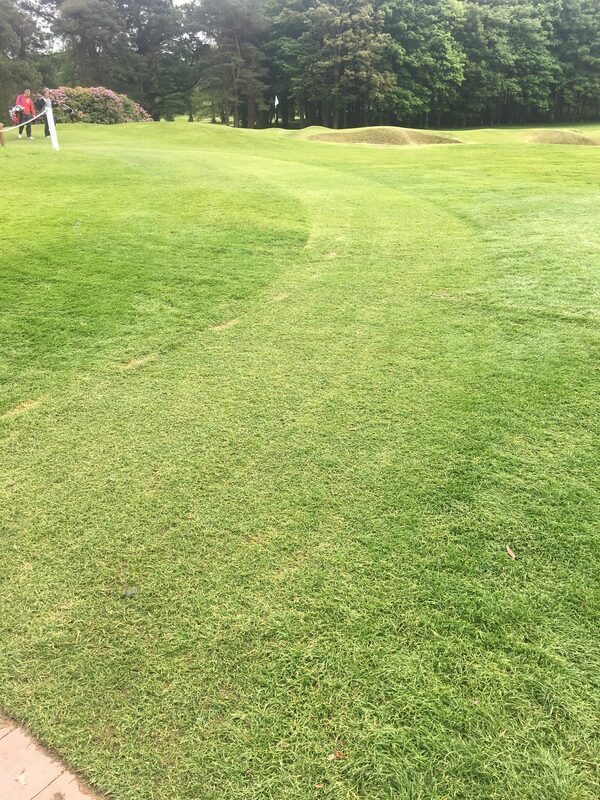 Pace is also increased with use off the Tru turf roller. 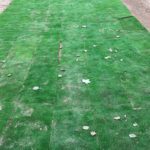 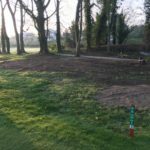 A grass path has been cut out in front of the pro shop around to the right hand side of the first tee ending in front of the tee box. 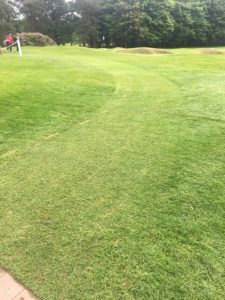 It has blended in very well with the rough giving a definite well defined pathway up to the teeing areas. 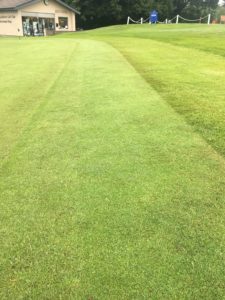 The introduction of hand mowing around the greens has greatly improved the definition between the longer grass just of the green side edge. 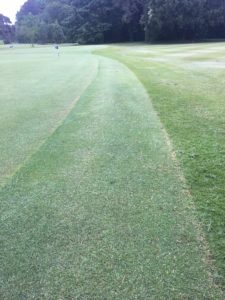 The cut width around the surround has been narrowed in from previous years and cut at a height of 8mm. 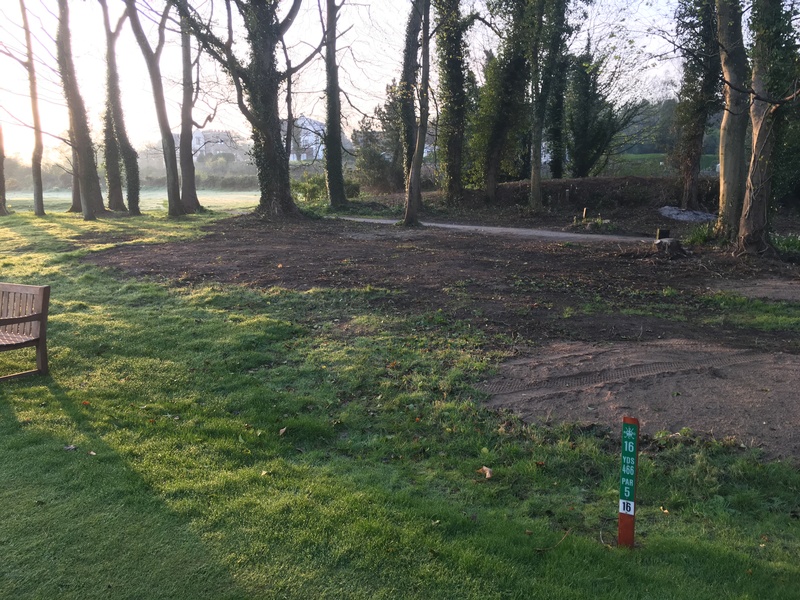 A lot of the long grass areas around the course has been removed and is now cut to normal rough height of 50mm. 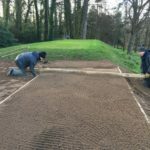 This will help speed up play on the course during busy times. 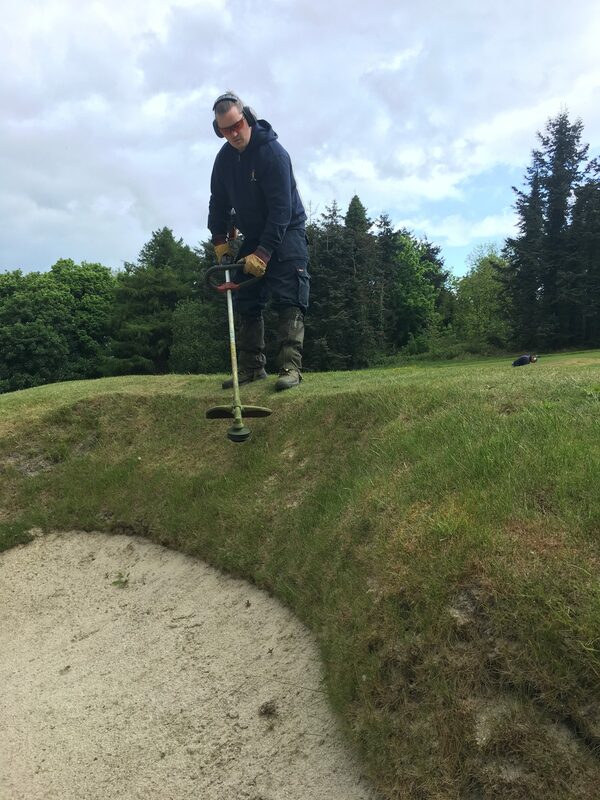 Poor wet weather conditions (35mm)on the week running up to captains day has not affected course presentation with all staff carrying on with daily tasks to keep standards to a high level. 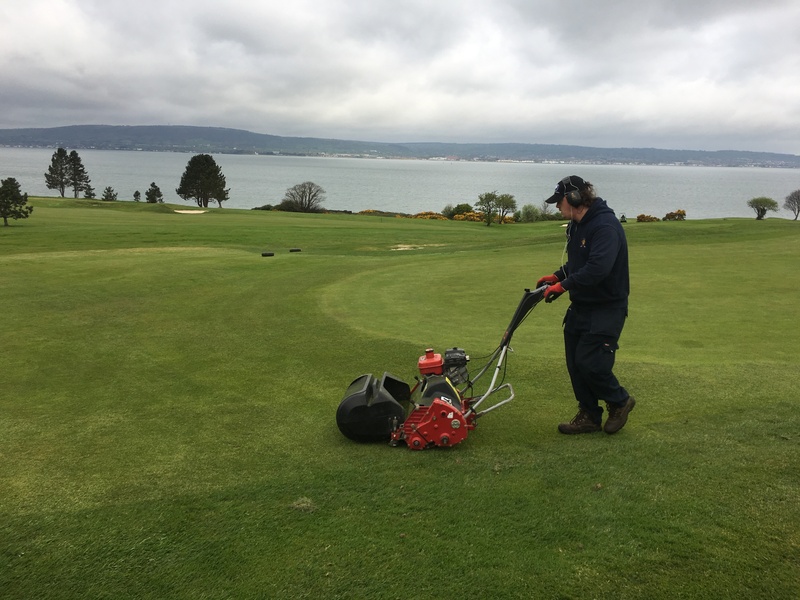 Rain and poor weather is a normality for captains week preparation so nothing new to report. 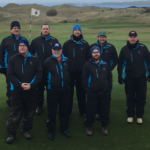 From everyone on the greens staff we would like to wish Mr Captain and competitors all the very best on his day. 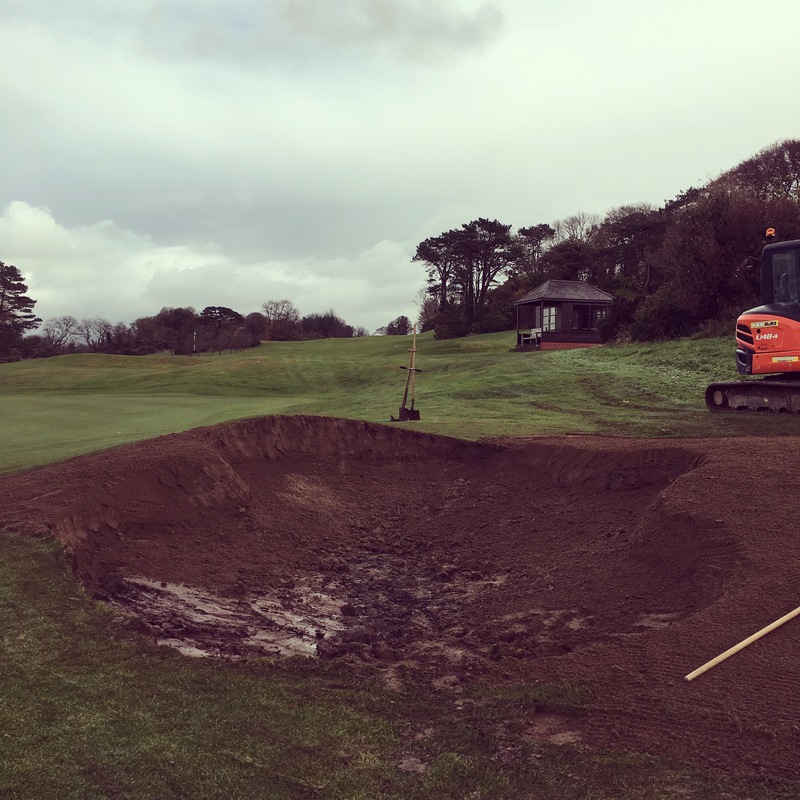 Our winter programme of work started with the renovation of the 3rd green. 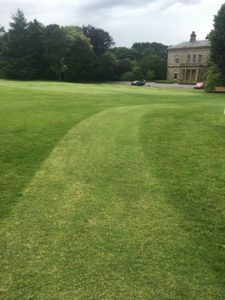 A particularly wet summer and previous winter exposed the weakness of the green being old natural soil with poor drainage and an aspect which often gathered rain water from the bank to the left of the green. 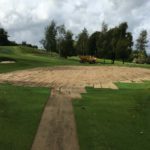 The rebuild started on the 29th of September with sod removal. 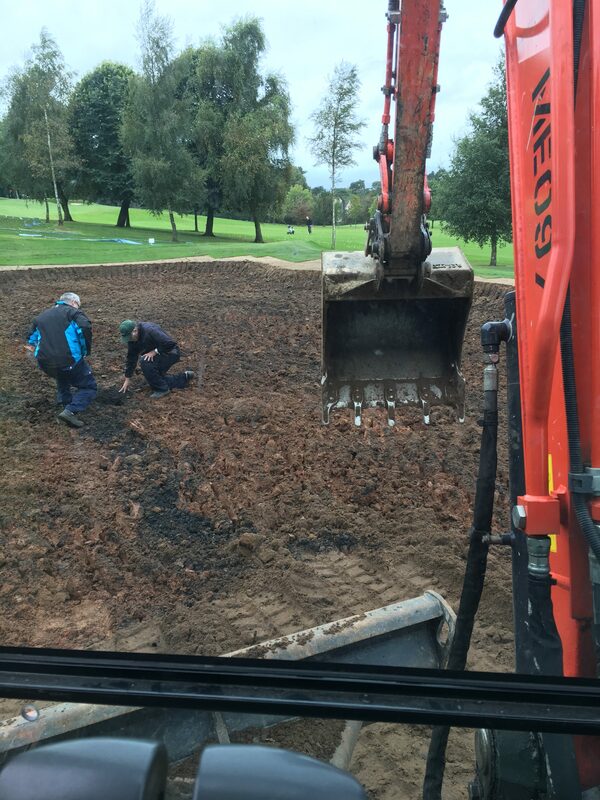 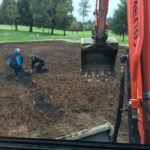 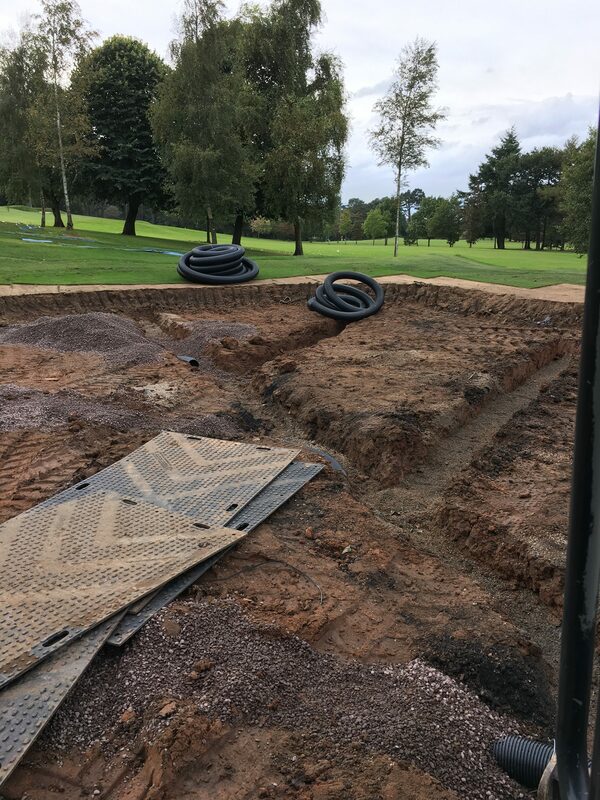 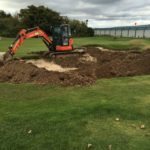 Excavation commenced on Monday 3rd of October removing the old soil, to help protect the surrounding areas of the green the use of track mats in front of the green across the 16th fairway to the avenue stopped any possible wheel marking from plant equipment. 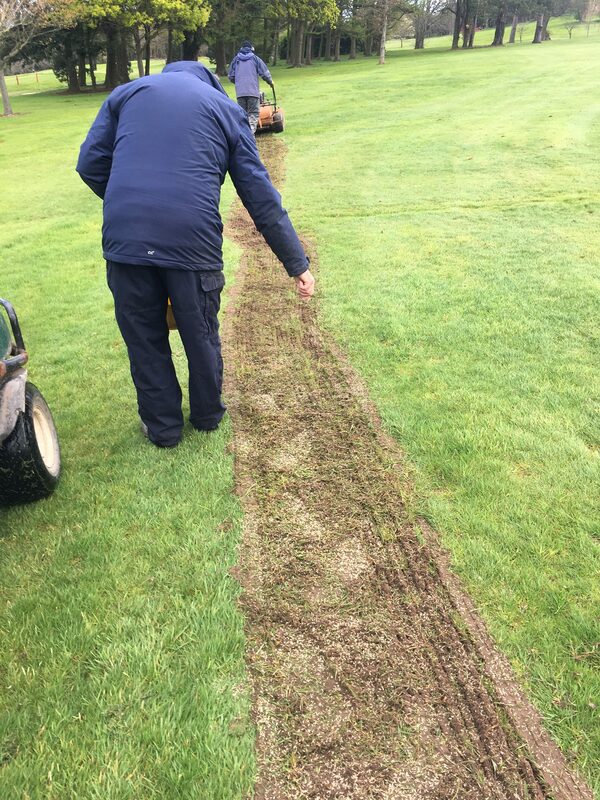 After all sub soil had been removed our Course Manager, Jim Eager marked out a herringbone drain. 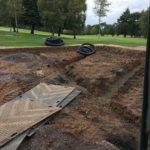 Whilst digging the new drainage system it was exactly in the same position as the old drainage layout which we did not realise at the time of planning and marking the new drainage. 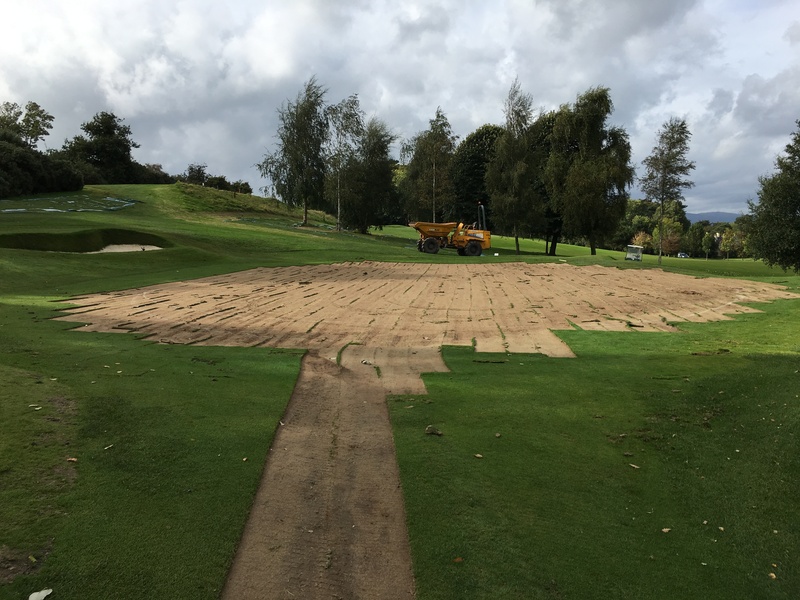 Good progress helped with sunny days and little or no rain. 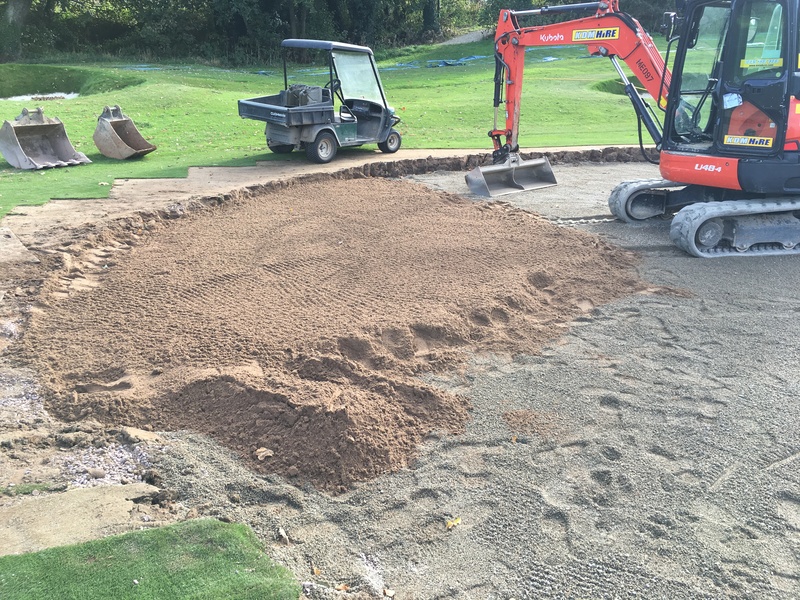 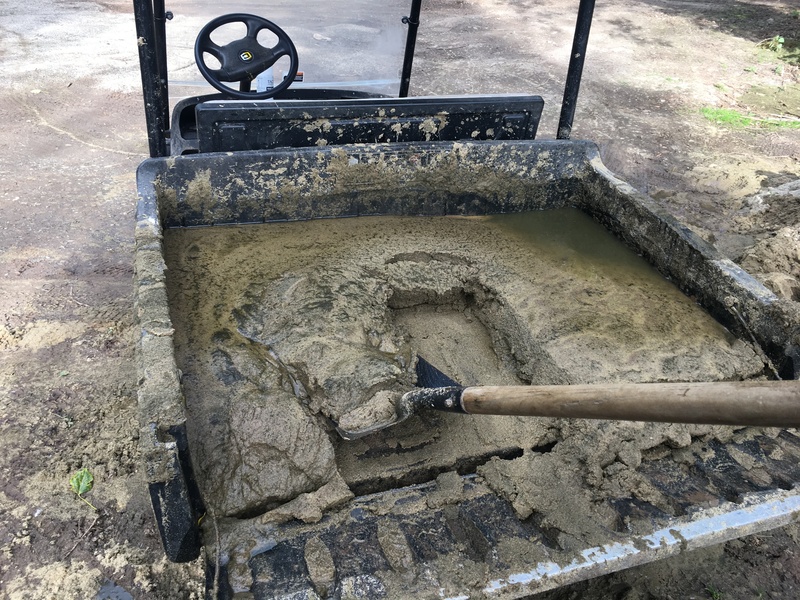 After drainage installation and correct levels achieved the green was back filled with a gravel bed then 85/15 root-zone mixture of sand and soil, with a high percentage of sand within the root-zone promotes a very porous structure to cope with any wet weather conditions. 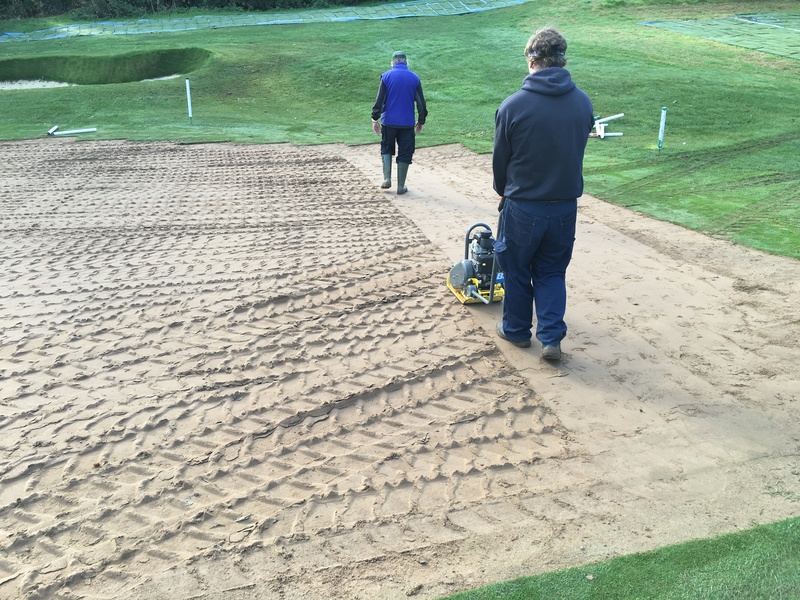 The use of a vibrating plate during the fine tuning stage helps to achieve a final level surface to lay the greens turf back down. 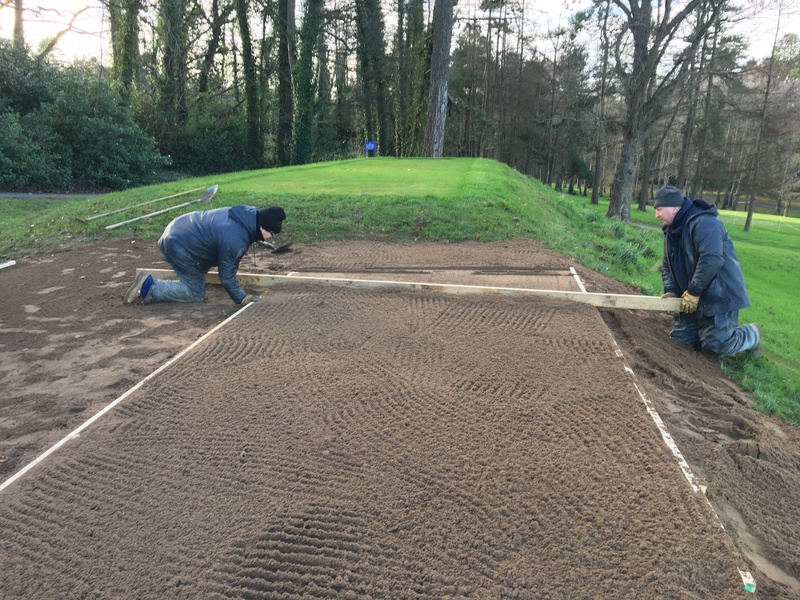 An exceptional team effort throughout the renovations helped us achieve a turn around of 14 days which gave the turf maximum time to knit and mature into the new root zone before the start of the 2017 season. 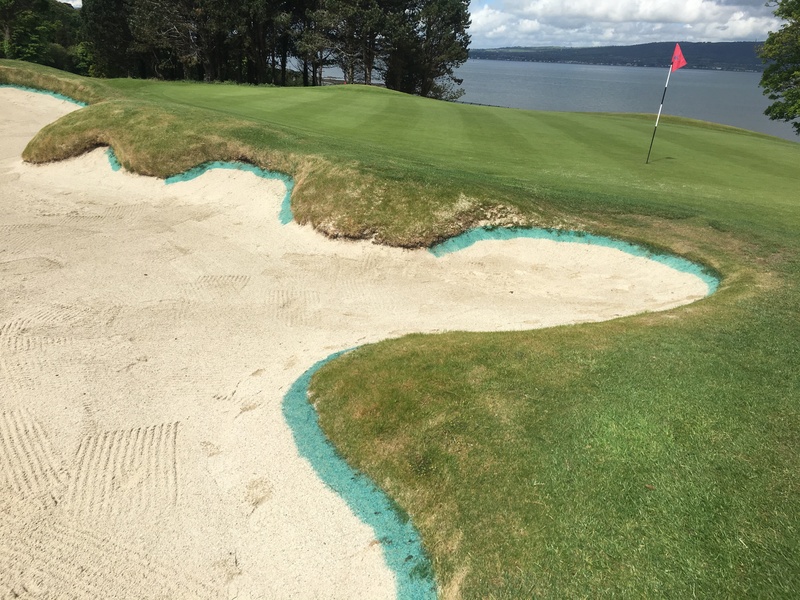 Our bunker project was in its final year leaving the 8th and 9th holes left to complete. 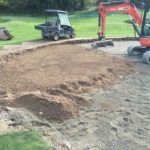 Construction started at the 8th green side where we remodelled three, filled one bunker in and made the pot bunker right of the green a lot larger in size. 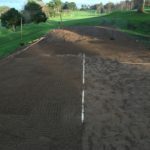 The centre bunker to the right of the green was deemed to be too far away from the green and was filled in and brought closer to the green and more in play. 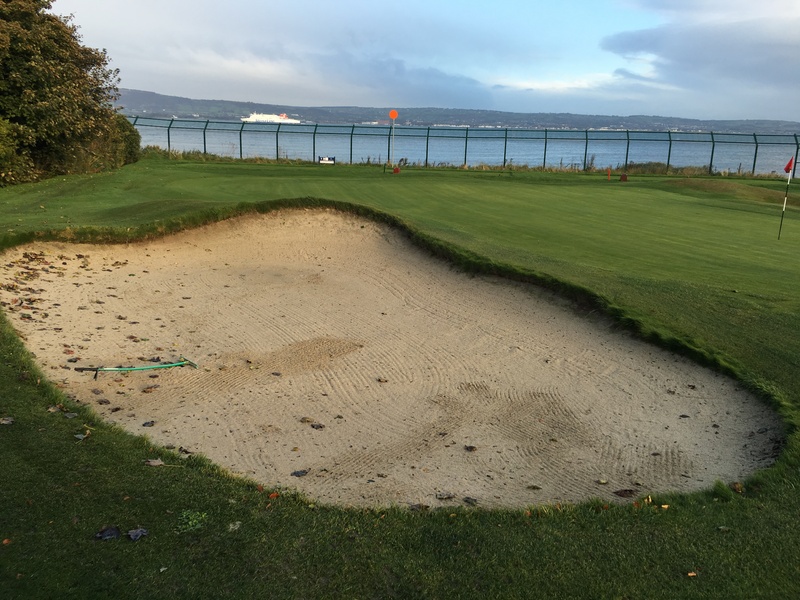 Green side bunker to the left was remodelled with the front right part of the bunker moved 2ft closer to the green. 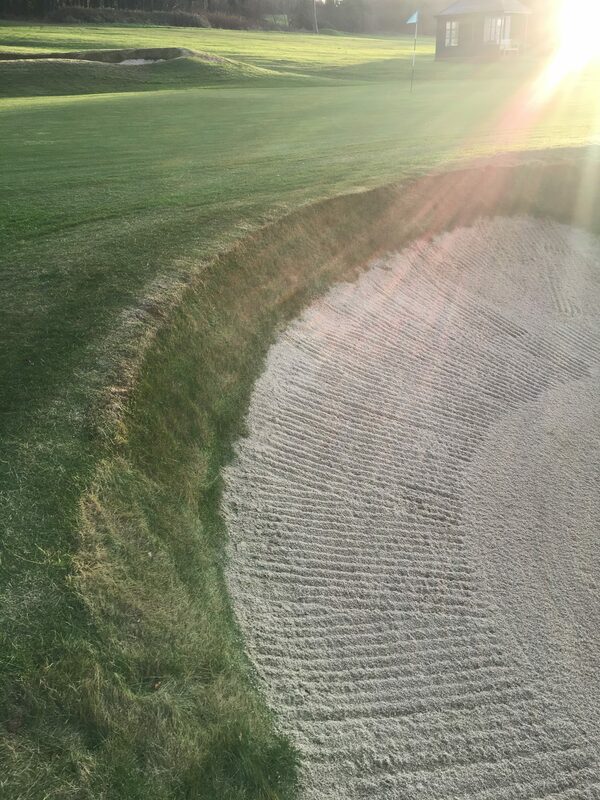 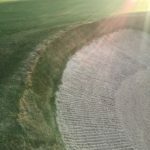 A more gradual slope into the bunker allows for a slow moving ball to trickle into the bunker and it also allows easier access in and out for play. 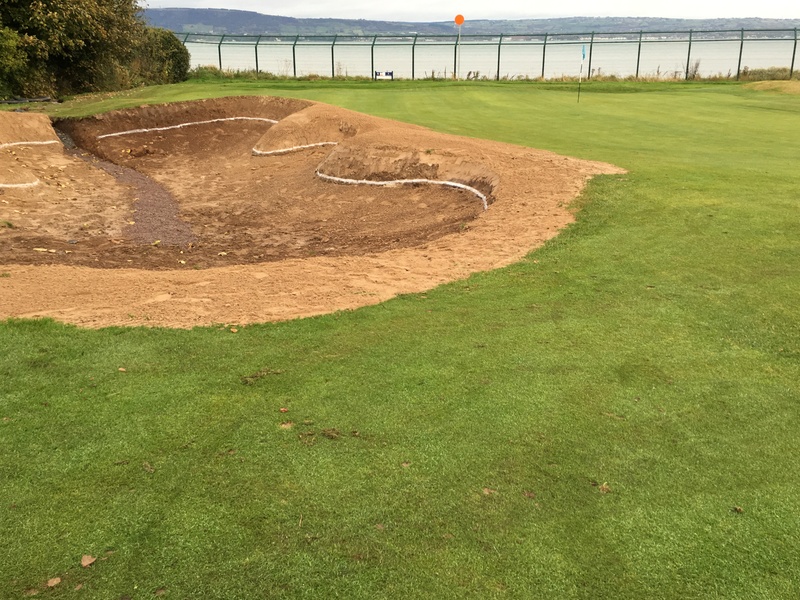 All bunkers had new drainage installed using 6inch pipe and 10mm round stone completed with a covering of porous material to keep the drainage stone confined, stopping any contamination with the new bunker sand. 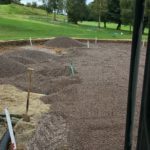 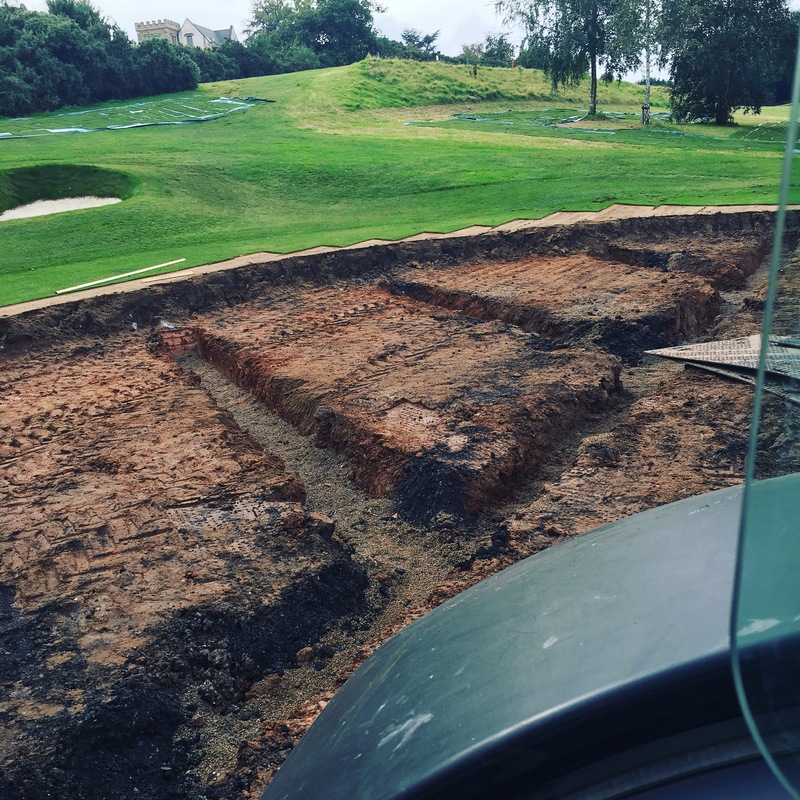 During the construction phase we re-used any excavated topsoil on site for mounding and shaping, this kept traffic on the course to a minimum. 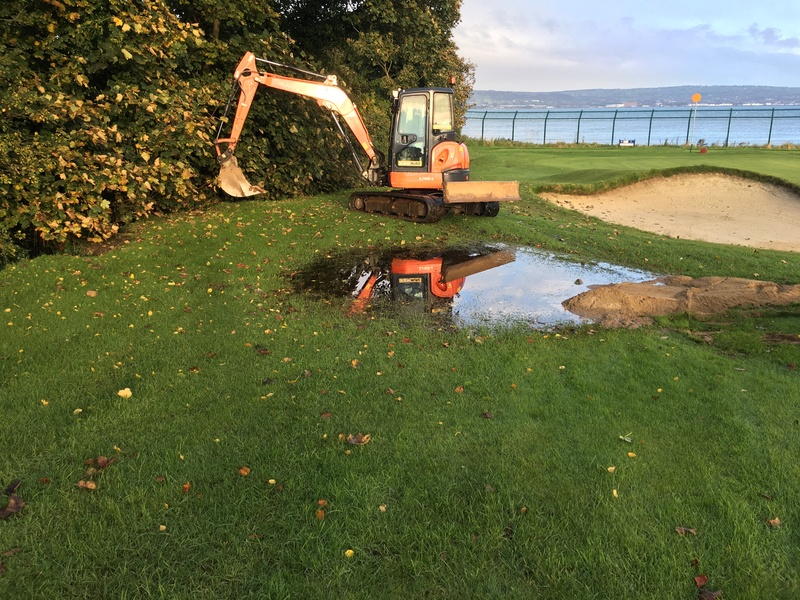 Re-shaping of the ground to the short left area of the green is now helping to remove any standing water that gathered in this small pocket down into the watercourse running along the 8th hole. 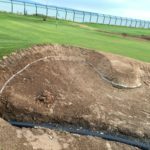 Not a lot of change in bunker positioning at the 9th hole, the two short fairway bunkers have been moved into the fairway to make the green entrance narrower. 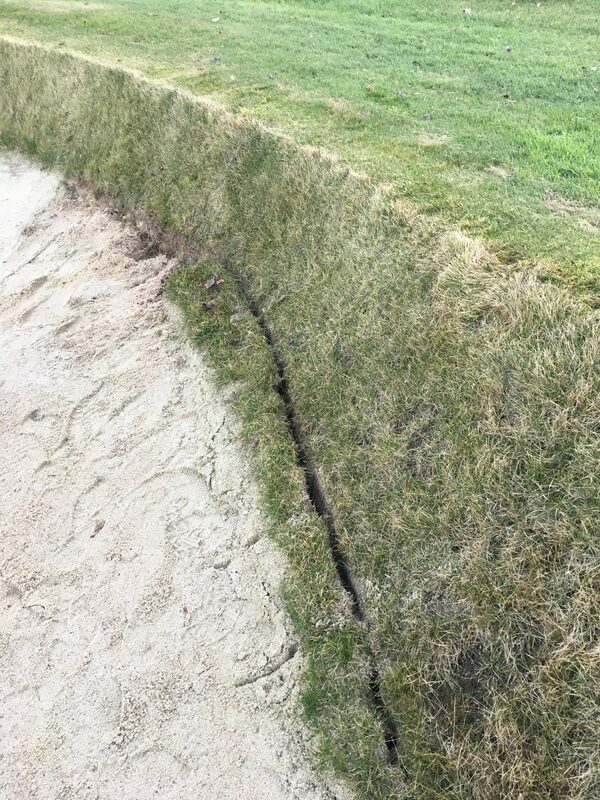 We removed the sand build up along the back edge of the bunkers to allow for a better visual of the new bunker face. 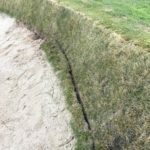 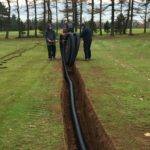 Drainage was renewed in all bunkers and turf laid before the start of the 2017 season. 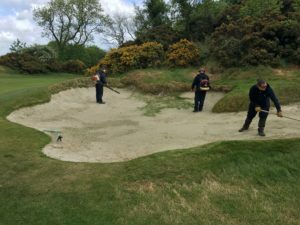 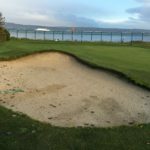 Bunkers have now been filled with Wicklow white sand. 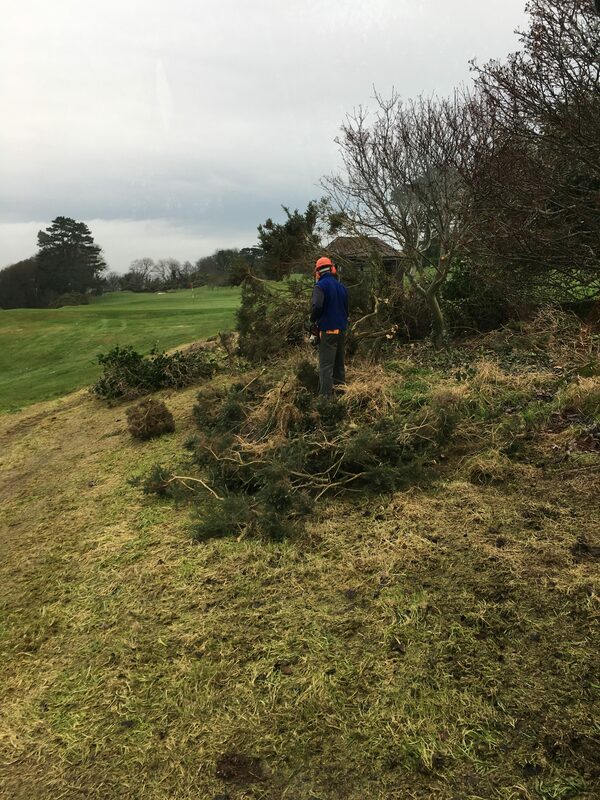 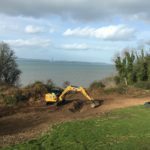 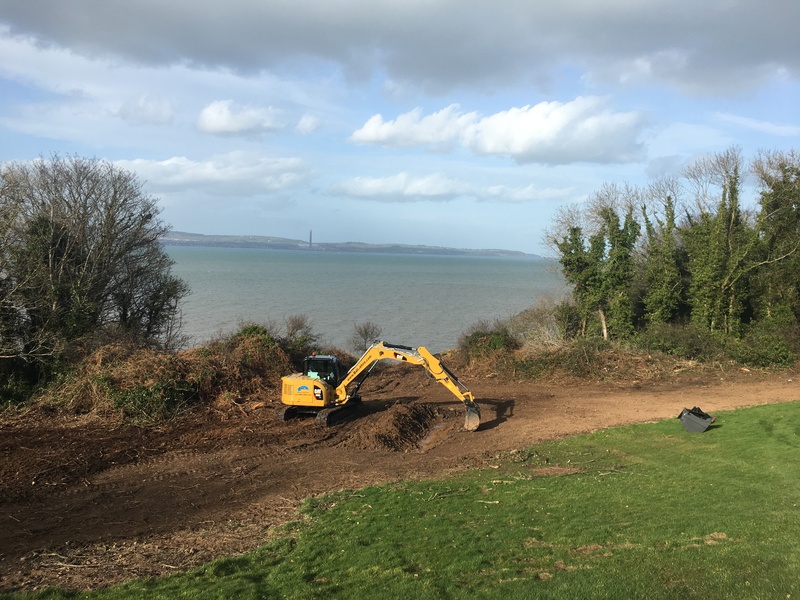 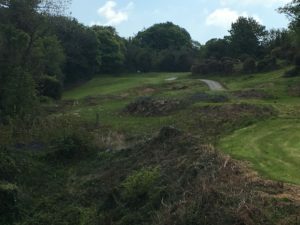 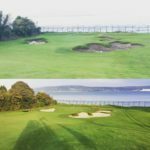 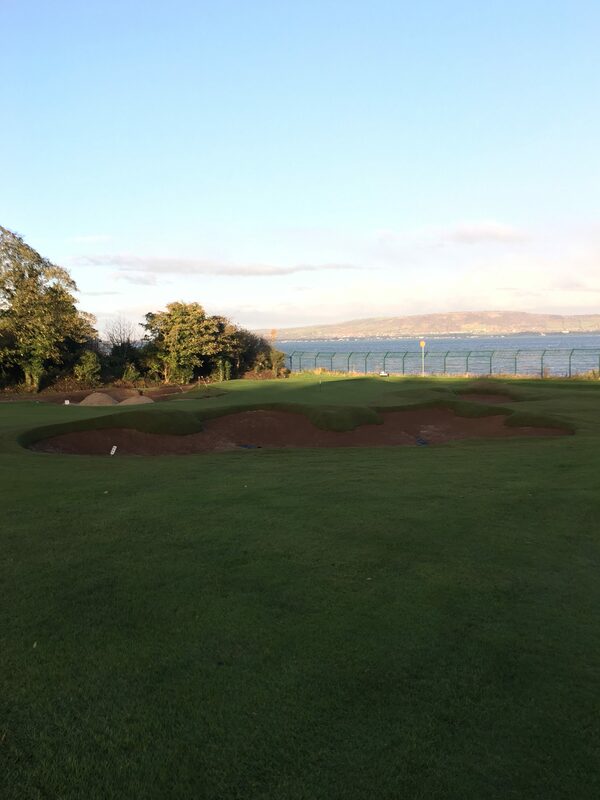 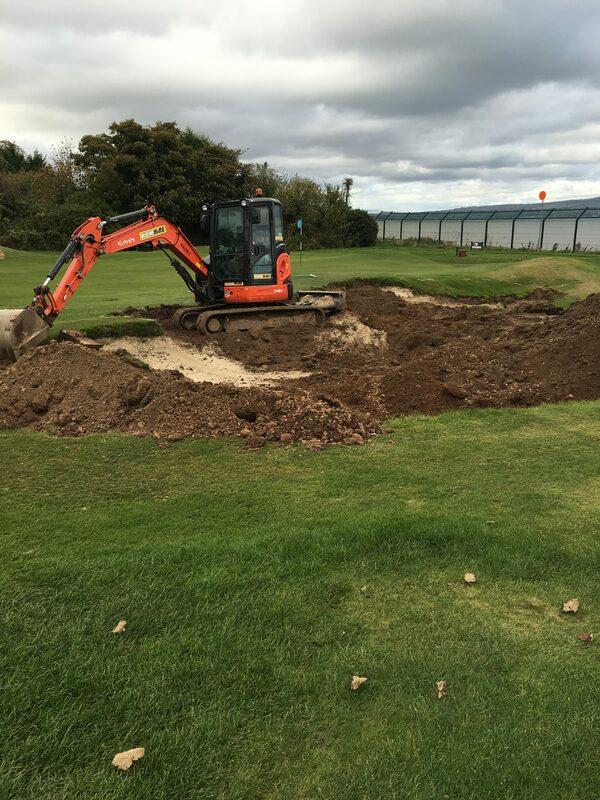 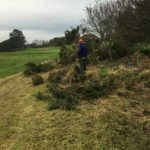 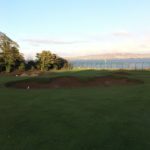 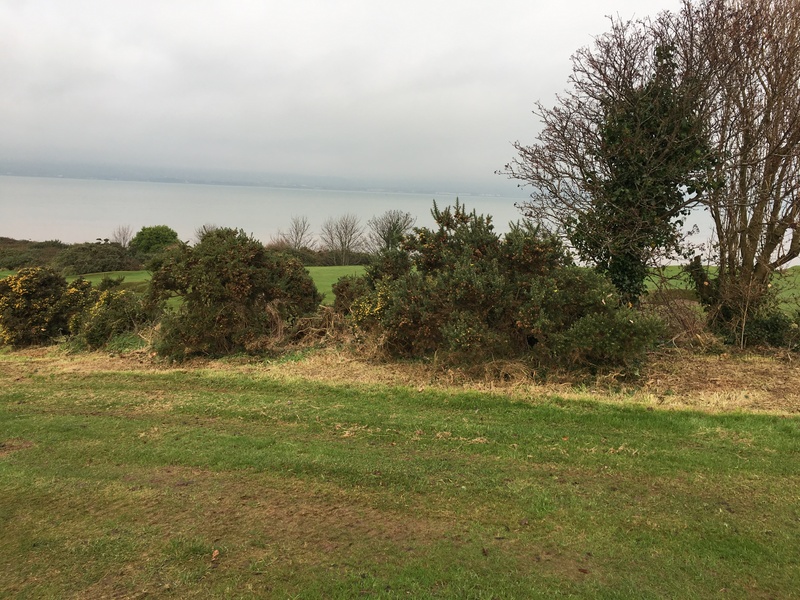 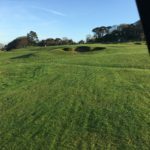 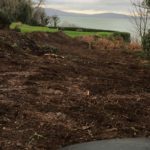 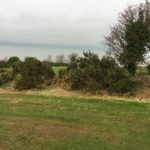 Extensive clearance took place this winter to open the vast view over the Lough with large trees removed, shrubs, wind bushes and long grass all being cleared to improve the visual of the hole. 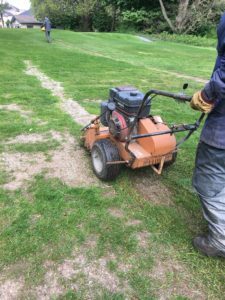 The area has recently been sown out with dwarf rye grass and a light top-dressing, once grass is established it will be cut at a manageable height. 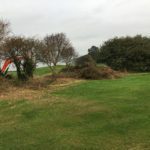 The area to the right of the 16th tee has been cleared of holly and small trees to allow more natural light and air flow onto the teeing area. 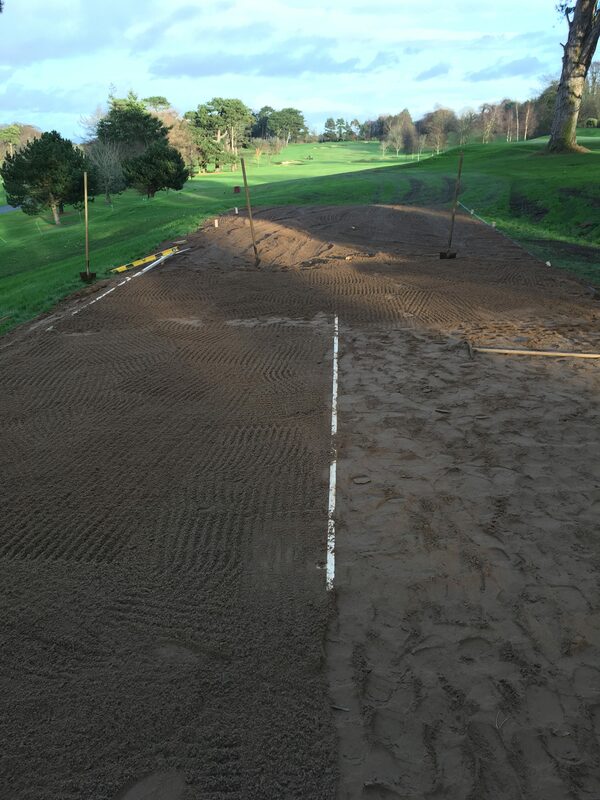 One of our wettest tee boxes has been rebuilt and re-levelled. 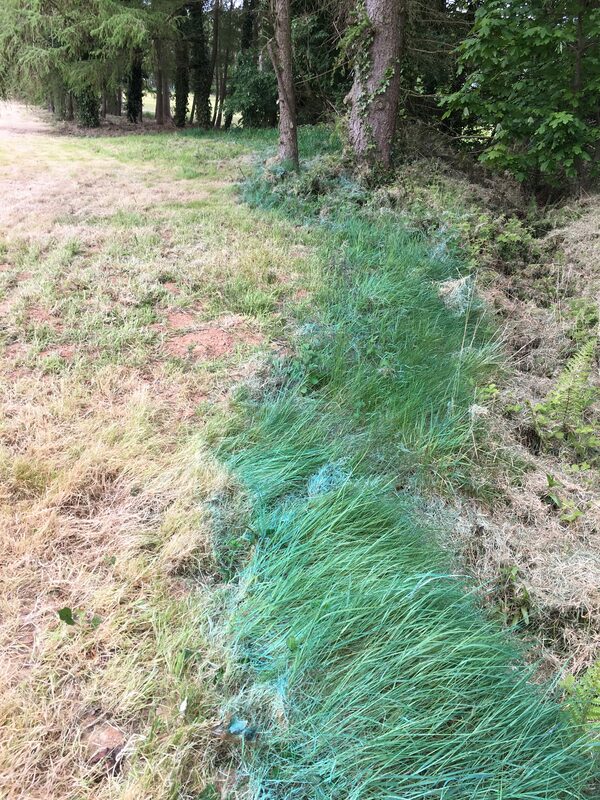 Poor grass coverage in a shaded area coupled with a poor draining soil profile being the cause. 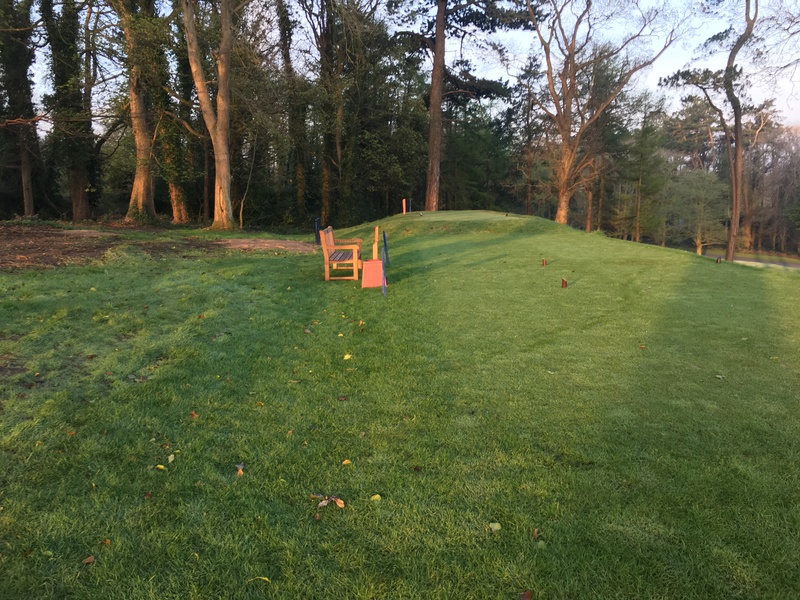 A decision was made to rebuild the tee. 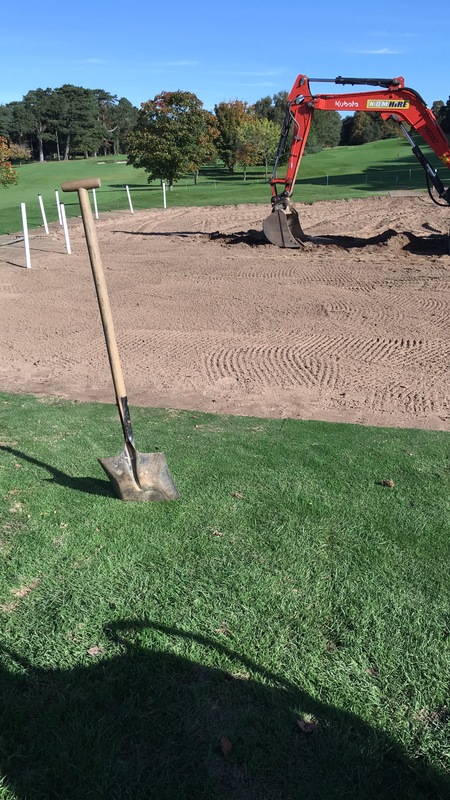 By elevating the new tee it will improve the drainage along with a 85/15 sand soil root zone. 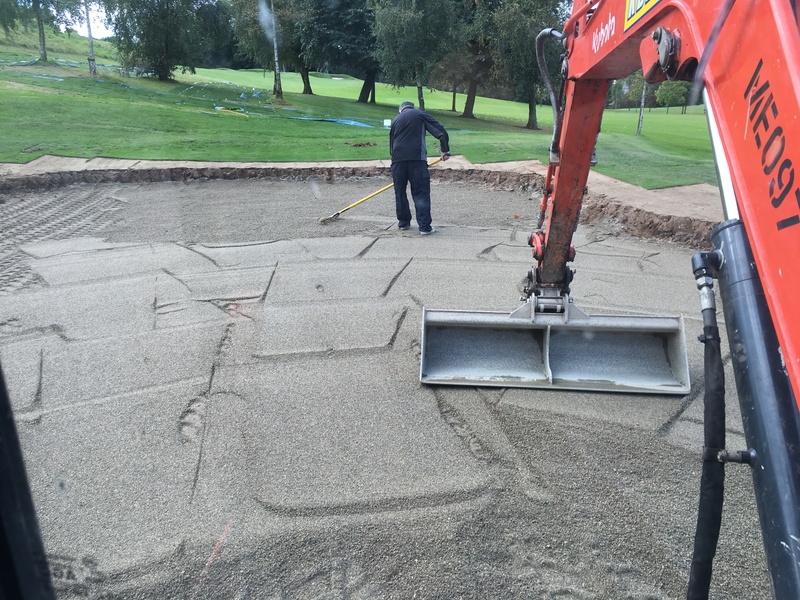 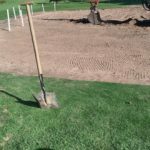 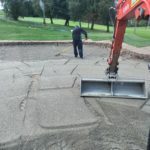 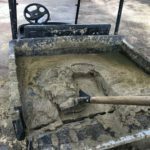 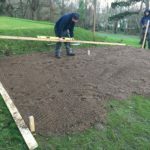 During the build the green staff boxed the tee off and screed-ed level with a wood frame and pegs to achieve correct levels. 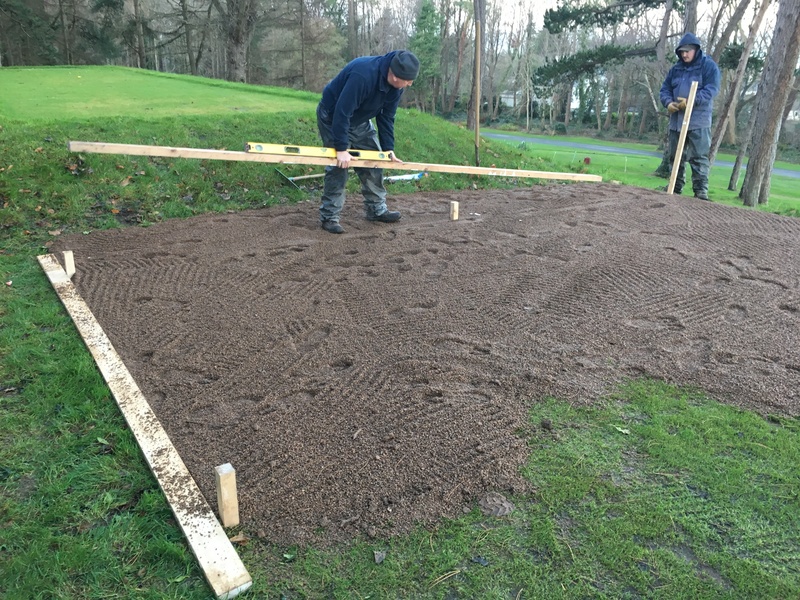 The winter tee at the 2nd has also been reinstated and will be used permanently throughout the winter period. 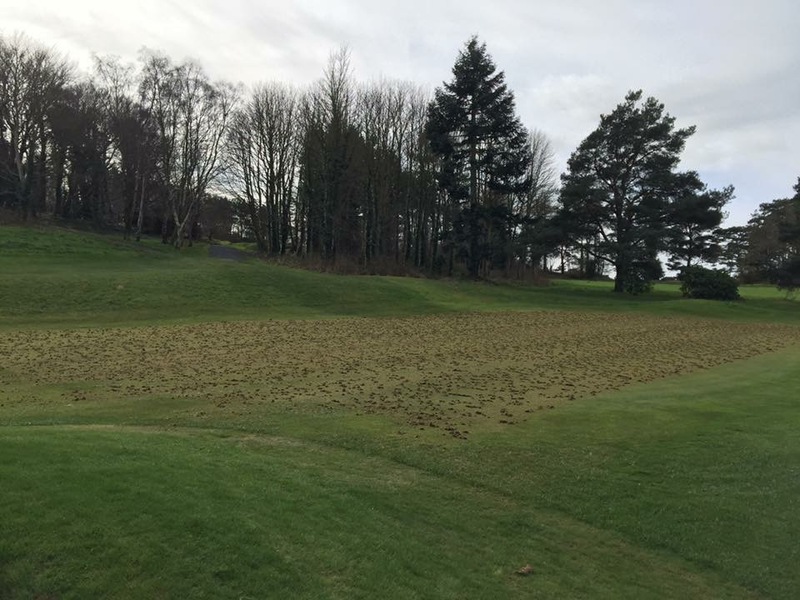 Greens staff completed this work in early March, giving plenty of time for recovery before the start of the golfing season. 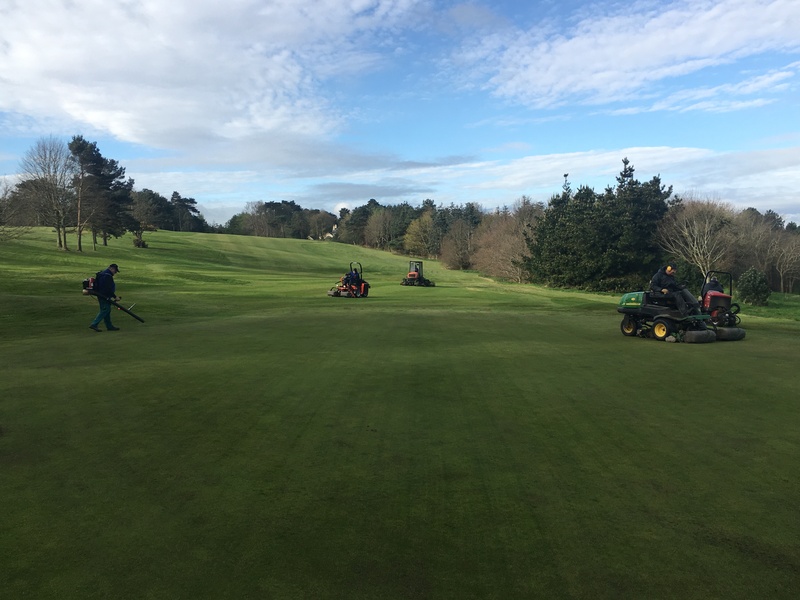 It is an important part of our yearly programme as it helps to reduce and control thatch levels and the greens also benefit from better surface drainage. 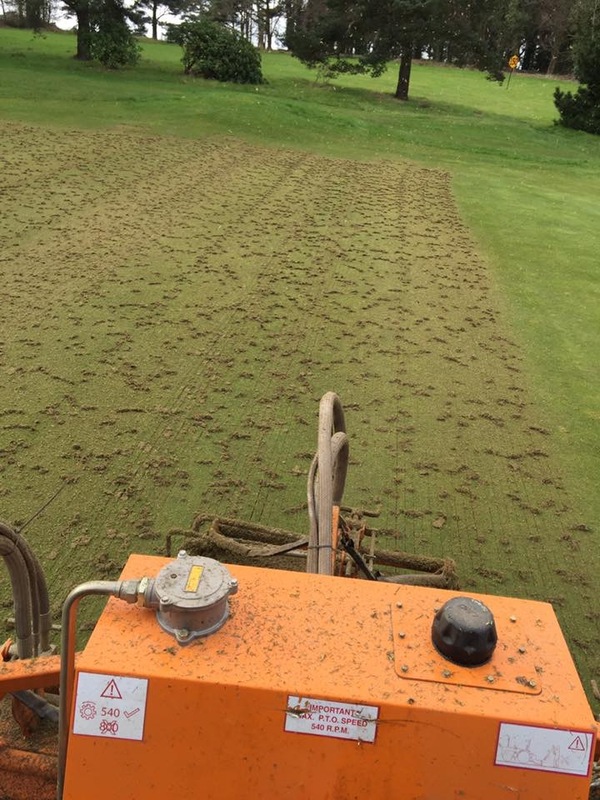 An application of sand top dressing after the process fills in the groves left behind from the scarifying tines. 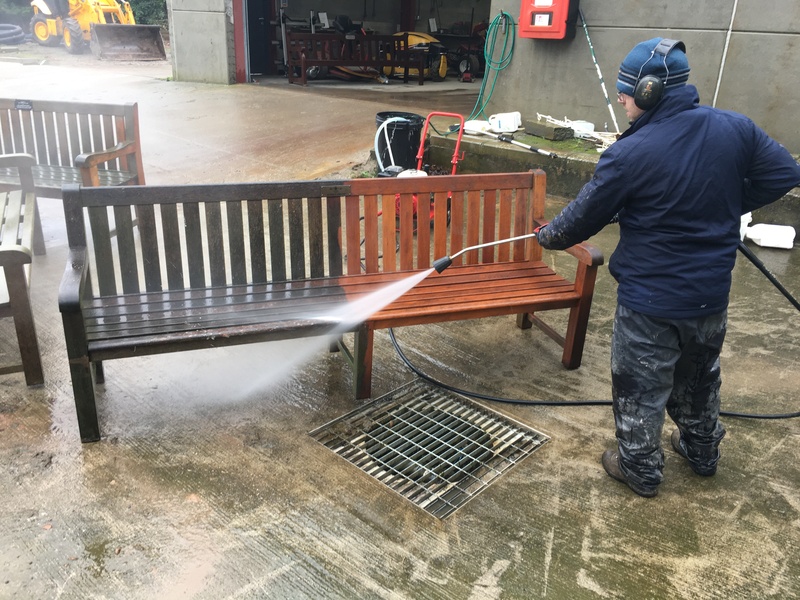 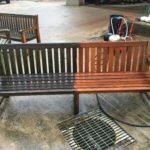 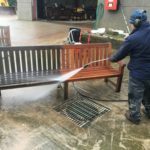 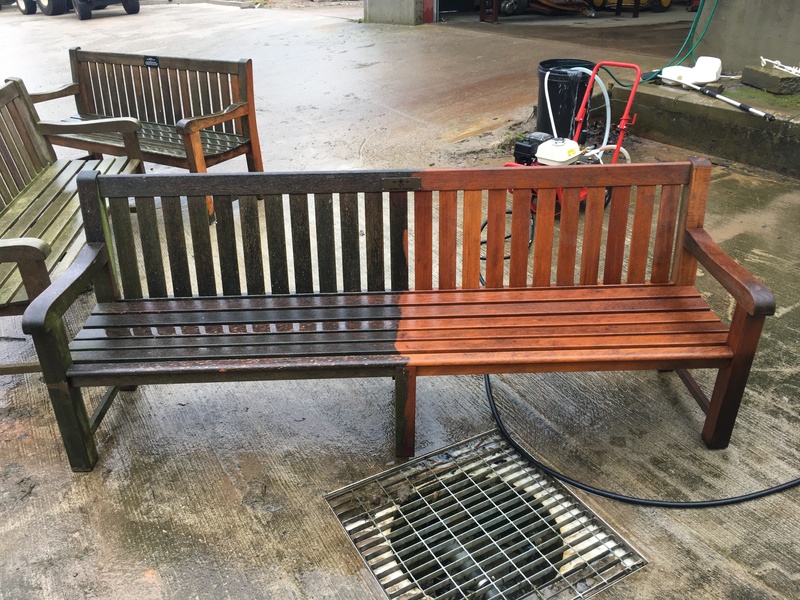 All donated benches have had their annual deep clean, machine sanded and coated with teak oil to help preserve and boost their appearance. 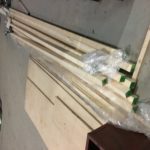 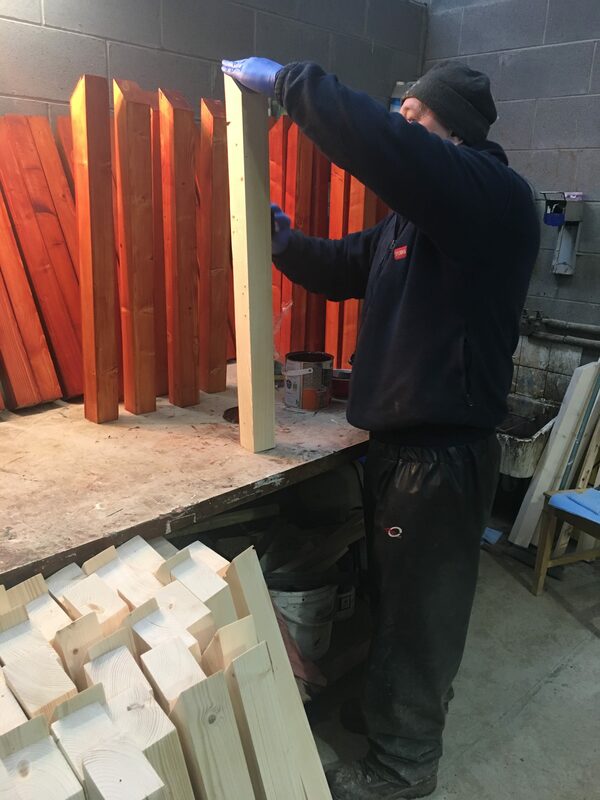 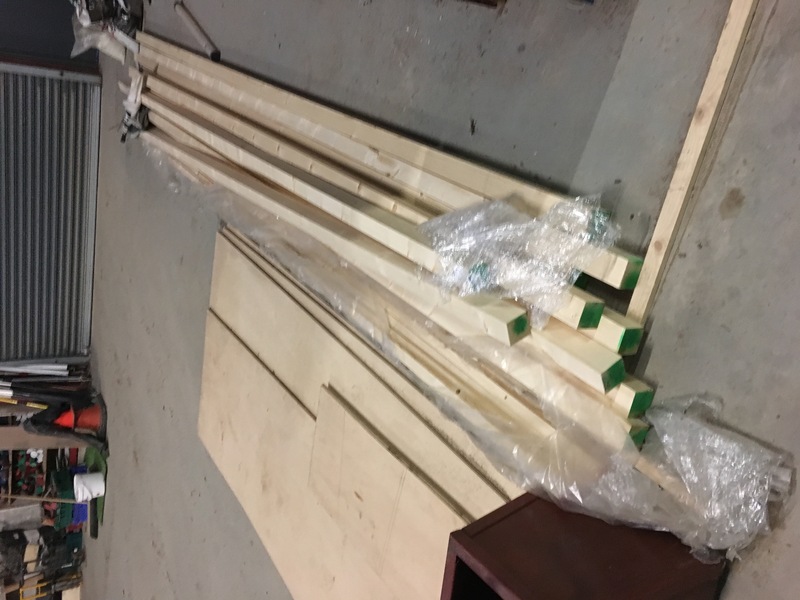 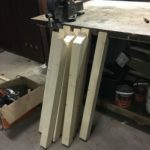 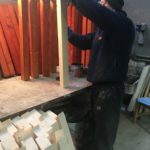 A total of 75 new tee yardage posts have been made from scratch, machine sanded and treated with deep mahogany wood stain. 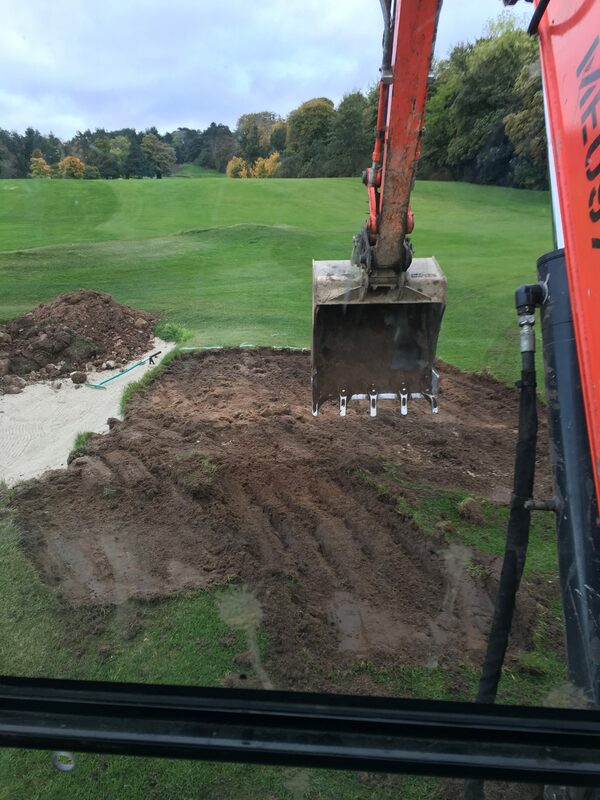 New bins are currently being finished and will be on the course within the next month. 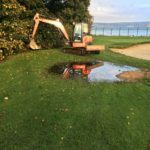 A particularly wet winter of 2015 had saturated the front 100 yards of the 16th fairway therefore draining the area was inevitable. 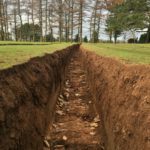 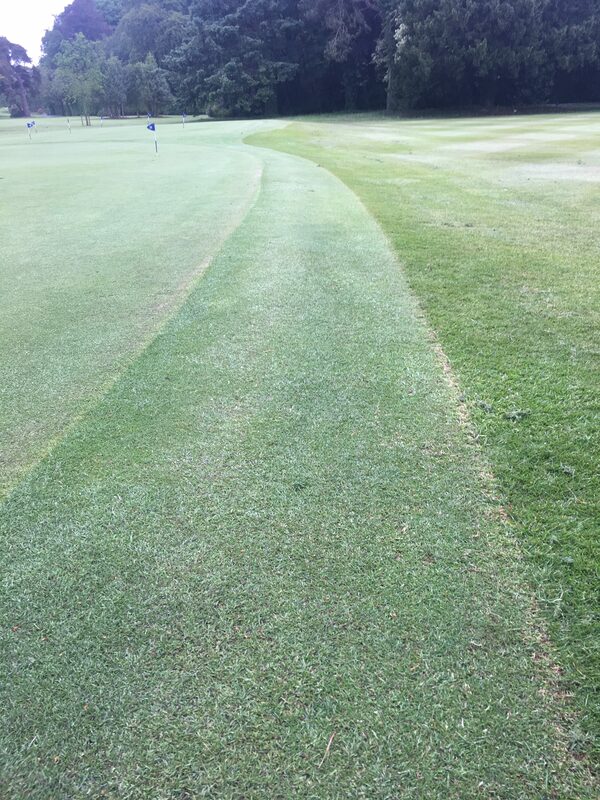 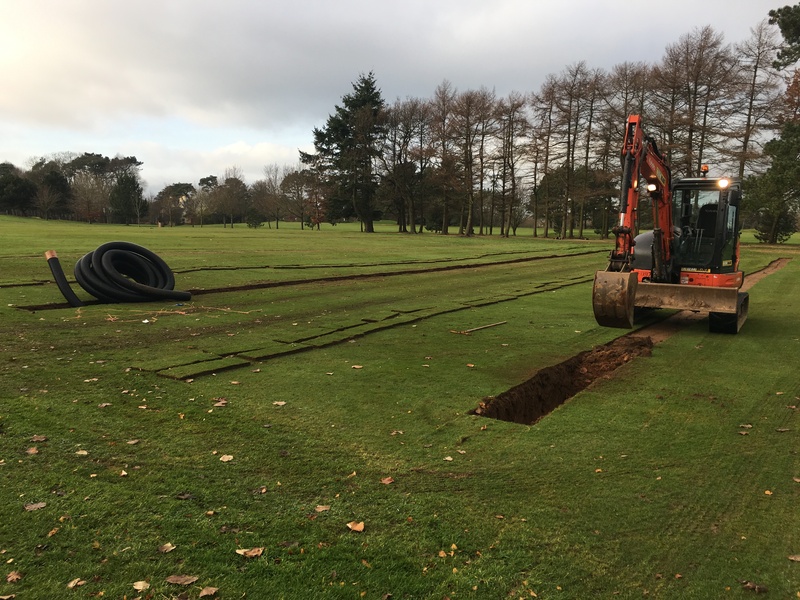 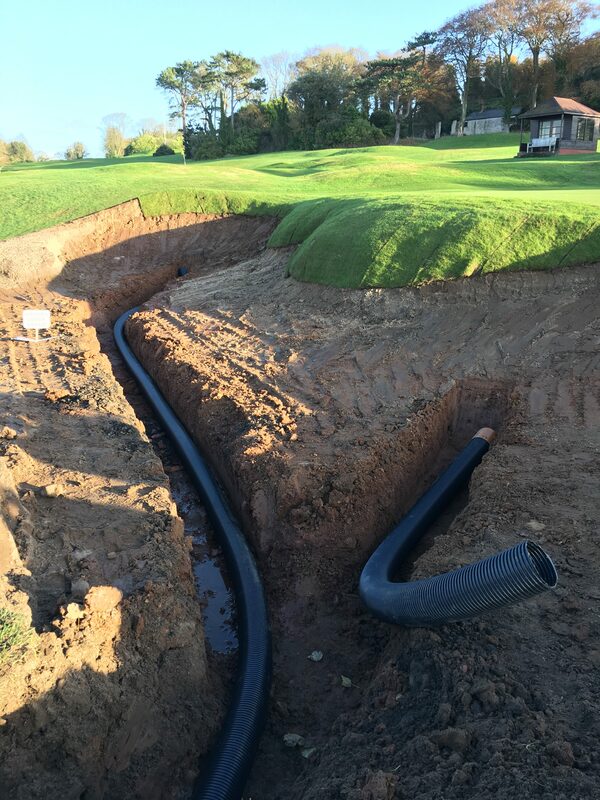 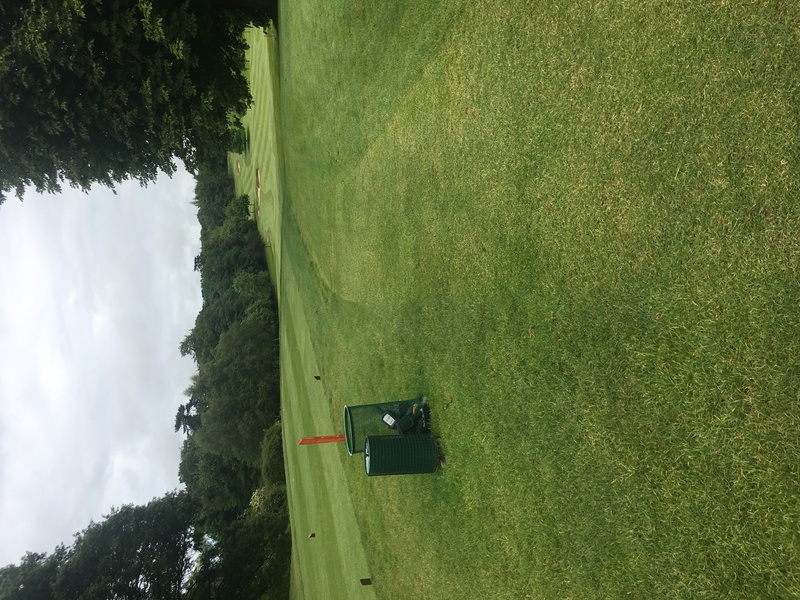 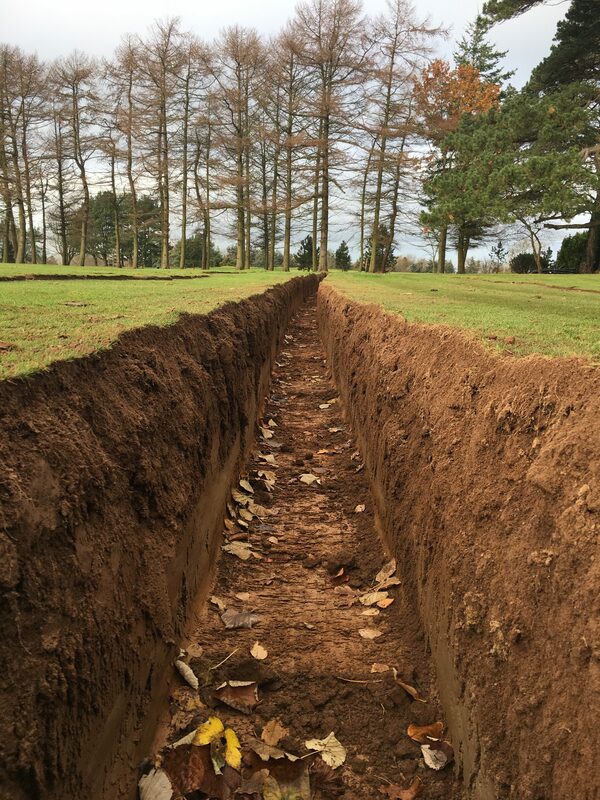 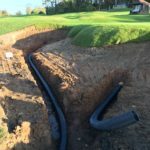 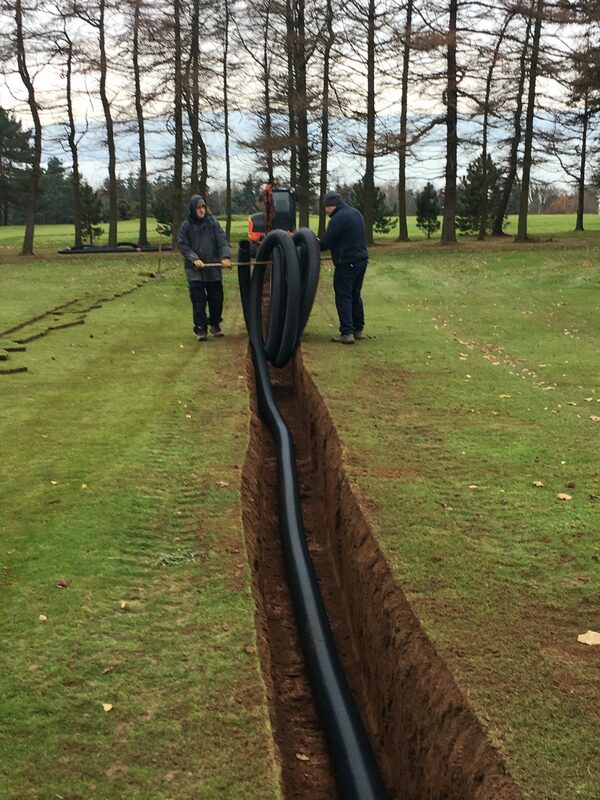 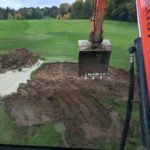 CRL Contracts had already put a main drain in during the summer of 2016 to the left hand side of the 16th fairway in the rough at a depth of 1 metre which allowed the green staff to put lateral drainage from the fairway into the main drain at a spacing of 8 metres between drains. 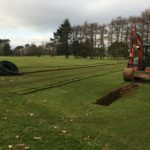 A total amount of 320 metres lateral drainage was installed which helped the area greatly. 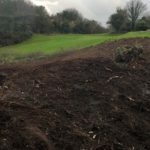 We plan to gravel band this area in the autumn of this year to further improve water percolation. Drainage at the 3rd hole required repair due to an old stone drain collapsing and caused back filling over the 3rd fairway . 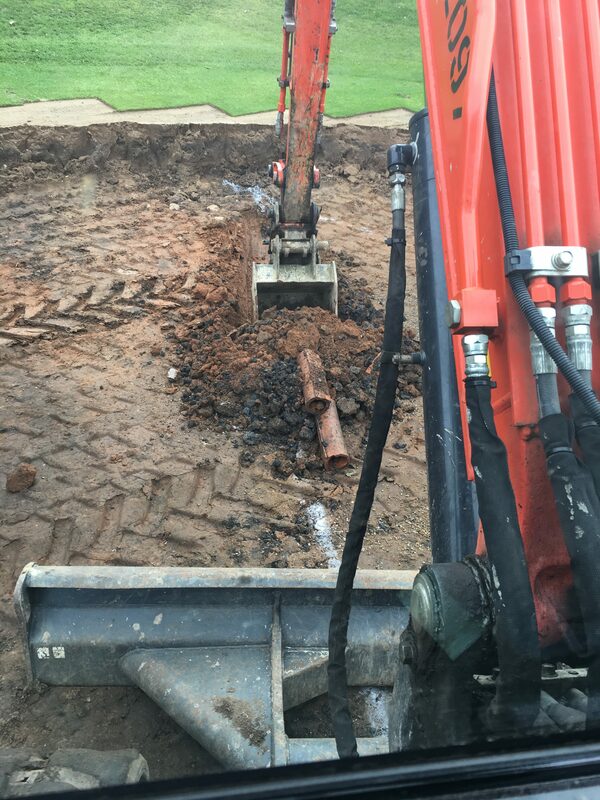 It was best to add extra drainage to the area to stop any further blockage or collapse from the very old existing stone drains. 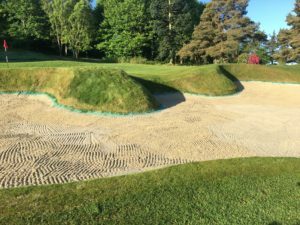 Each winter the bunkers are re edged to remove any flat areas that occur during the summer months. 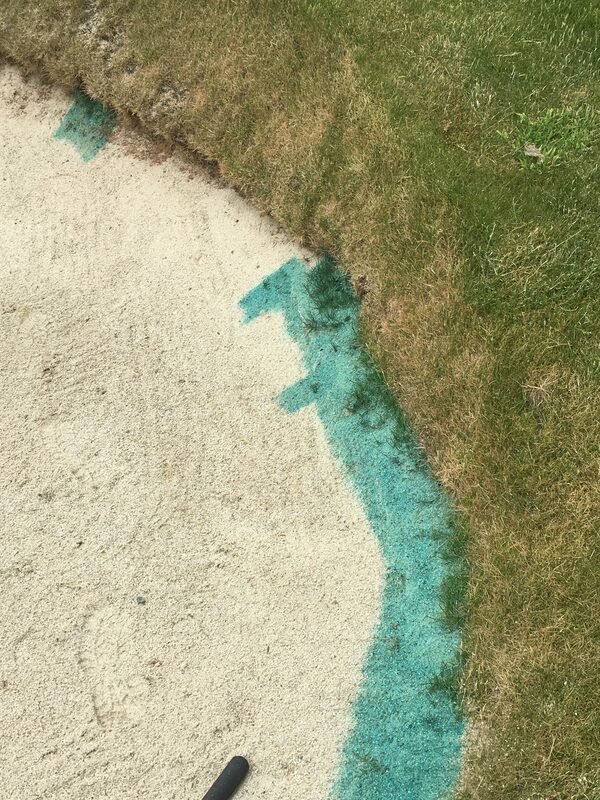 Lateral growth from the bunker edges into the sand is removed to stop a ball resting on this area. 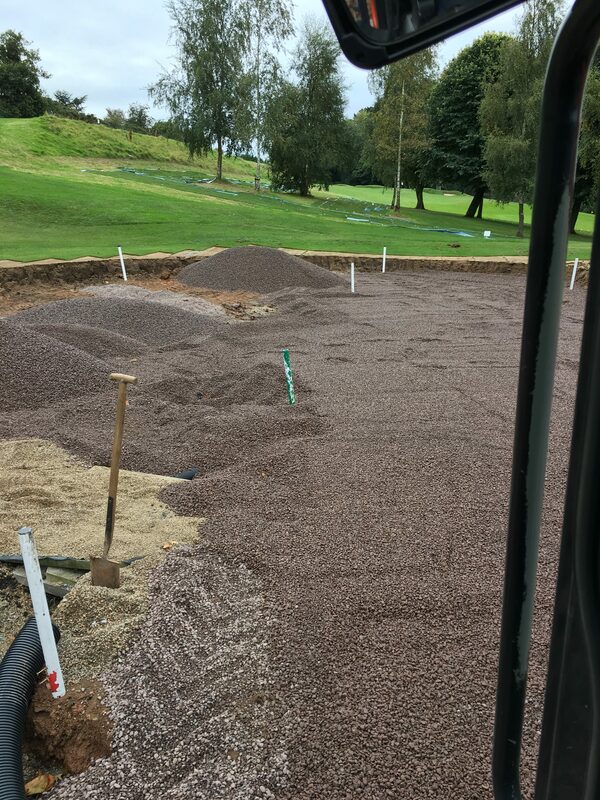 Top half of the 8th fairway (1700 metres in total), the right hand side of the 1st and the 3rd fairway have been gravel banded with 6mm gravel. 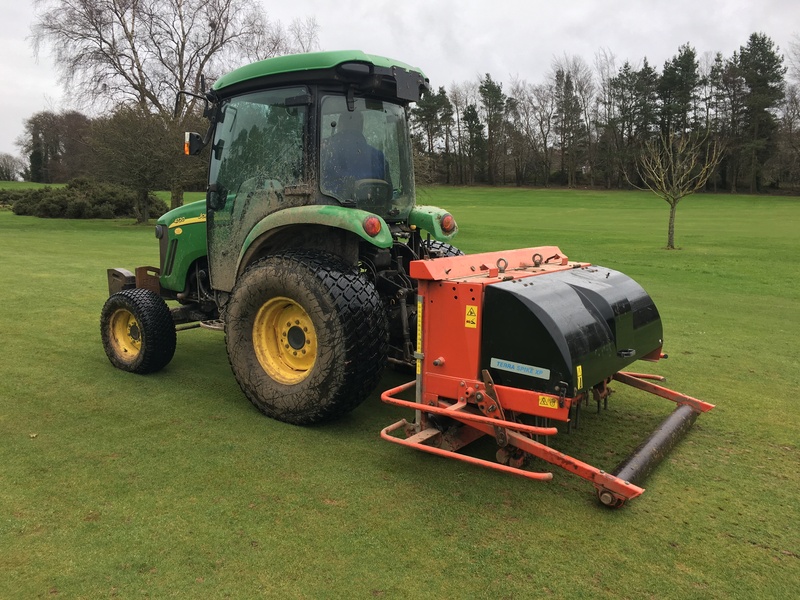 This machine is used for secondary drainage it cuts a slit with the cutting disc mounted on the front then closely followed by a 25mm wide tine that slices open the soil to create a 150-300mm depth trench which is immediately filled with 4-6mm gravel and the process is finish with a rear wheel that presses down on the band and partly closes it back over to leave the ground look as near as untouched. 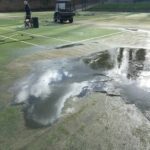 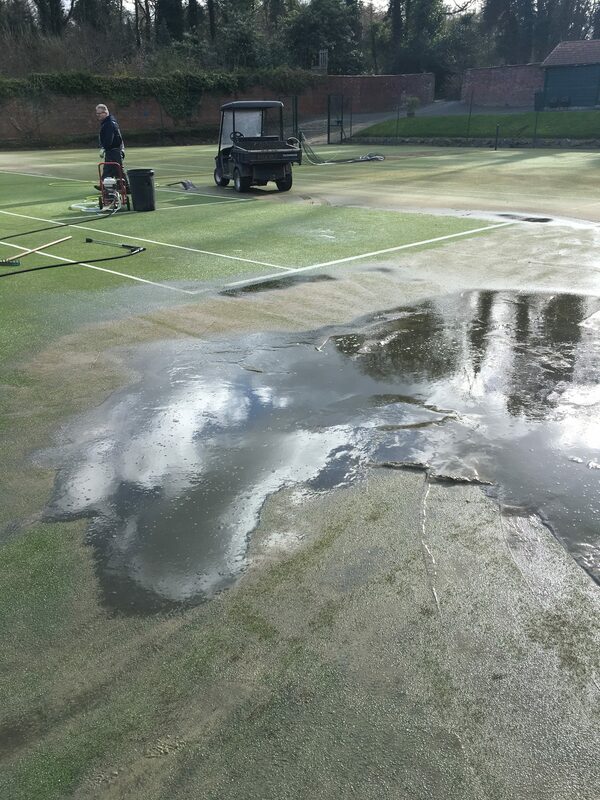 Recent power washing of the tennis courts removed moss and algae that had been growing in the least used areas. 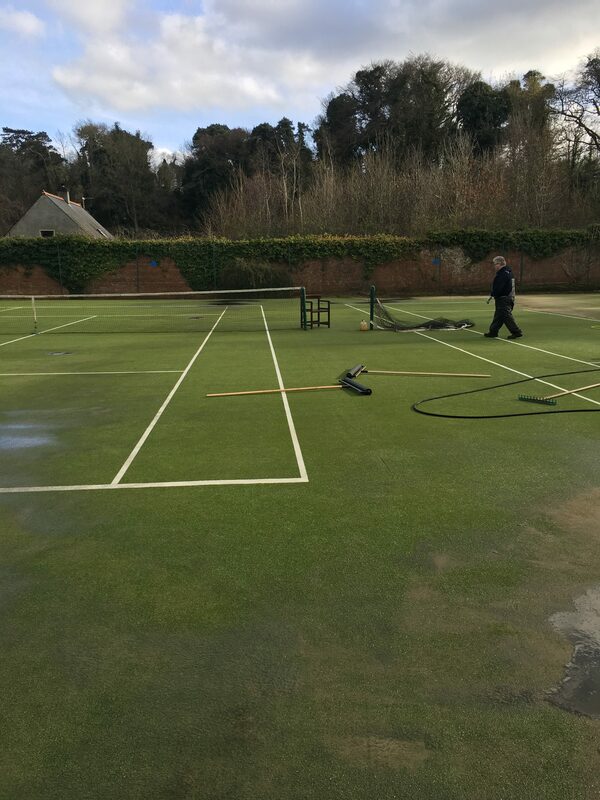 All courts have now been topped up with kiln dried sand to replace the original sand which had been removed from the power washing. 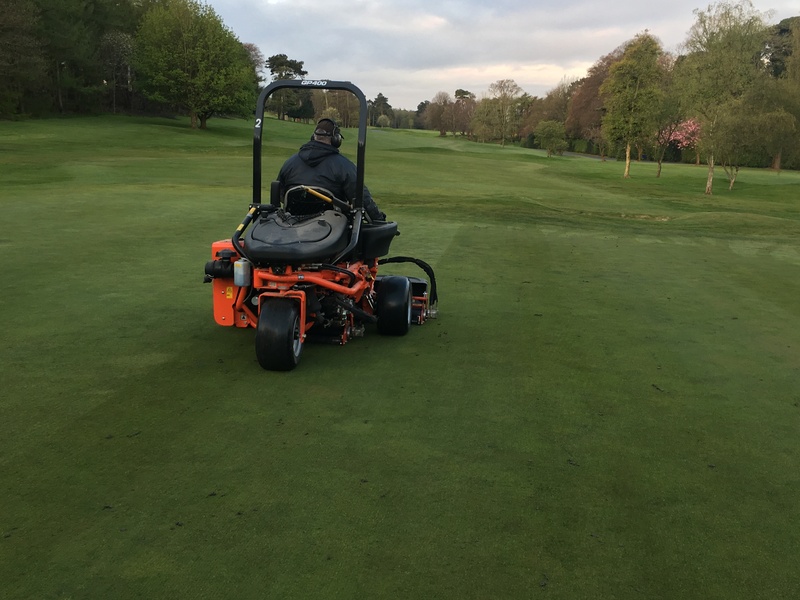 Greens have received monthly spiking, tees and fairways have all been aerated with a shock-wave type aerator. 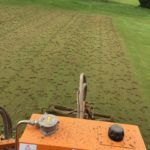 Tees, fairways and heavy traffic areas have also been verti-drained to relive any compaction which had occurred during the summer months. 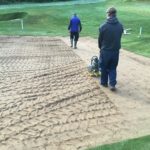 Sand top-dressing has also been on going on greens, fairways and walk off areas. 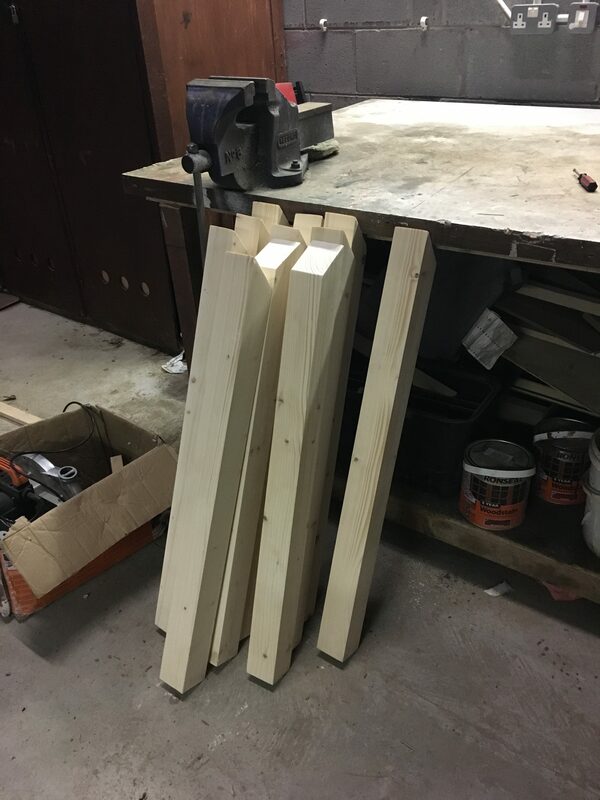 All staff recently completed a Manual Handling course, Fire Safety Awareness training and are now currently under going first aid at work qualification. 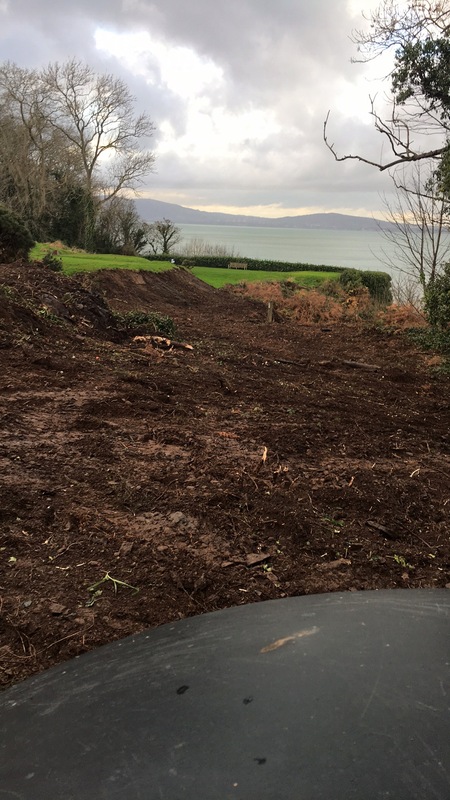 Paul McAuley and Joseph McCaffrey both received chainsaw certification. Paul McAuley and Allen Gallagher are currently attending Greenmount College doing Level 3 Sports Turf Management courses. 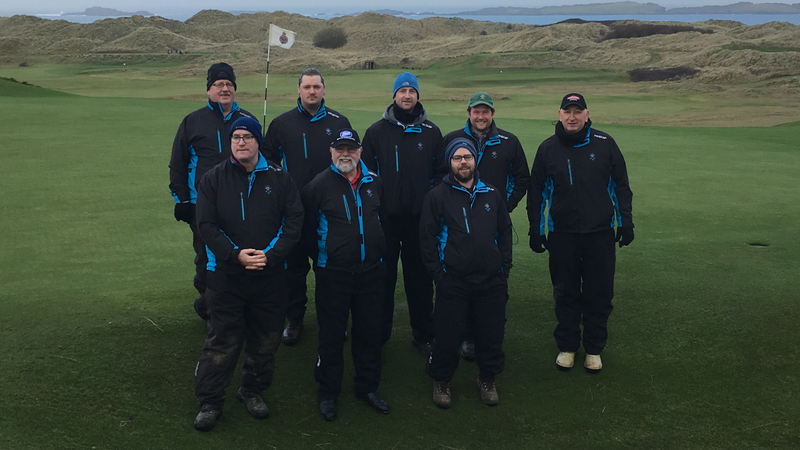 A busy winter for the greens staff who have put in a fantastic effort and will continue this with the golfing season of 2017 upon us. 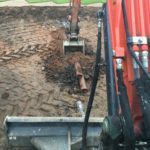 All work had been carried out in house to a very high standard. 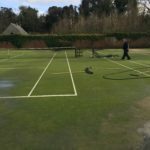 Good time of year for moss removal and light application of fertiliser to get things moving.